After moving into my home a few months ago, my priority from day one was to continue to build out my garage into my dream workshop. Garages will always have their limitations, so I have been consistently trying to best utilize my space before making any bit decisions. 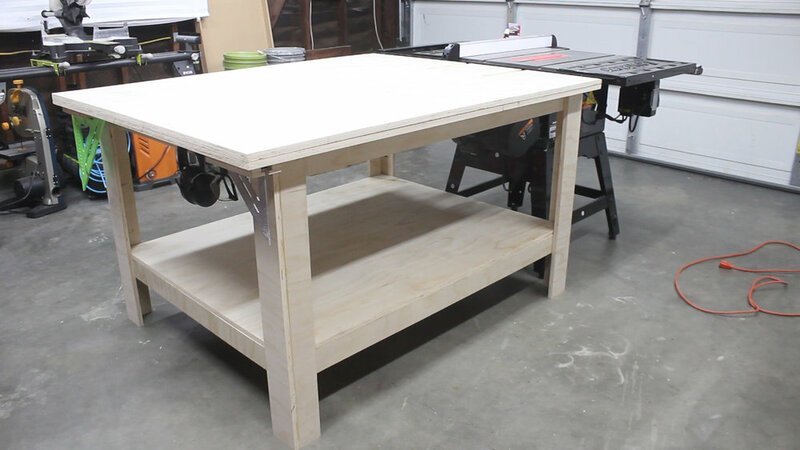 This workbench was a long time coming - something big, robust, heavy as all hell, and that gave me storage with a ton of work area surface. Excited to share my build! You can see the sad state that was my "temporary solution". These cabinets weren't bad necessarily, but they were very ineffective for what I needed moving forward. 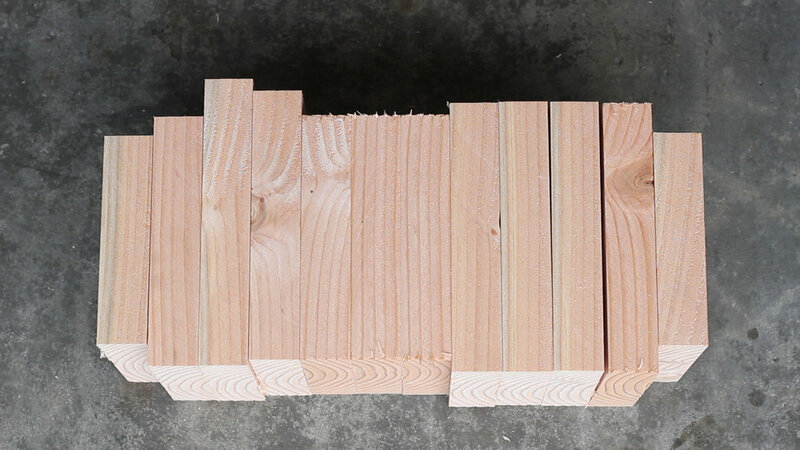 2 x 10' x 4" x 4"
My 4 x 4's were 10' long, so I marked out 34" (Pic 1) and ripped to length on my miter saw (Pic 2). My saw is just big enough for this. I repeated that for all six legs (Pic 3). Pic 1 shows how I plan to cut dados and half lap joints into the legs to accept stretchers. 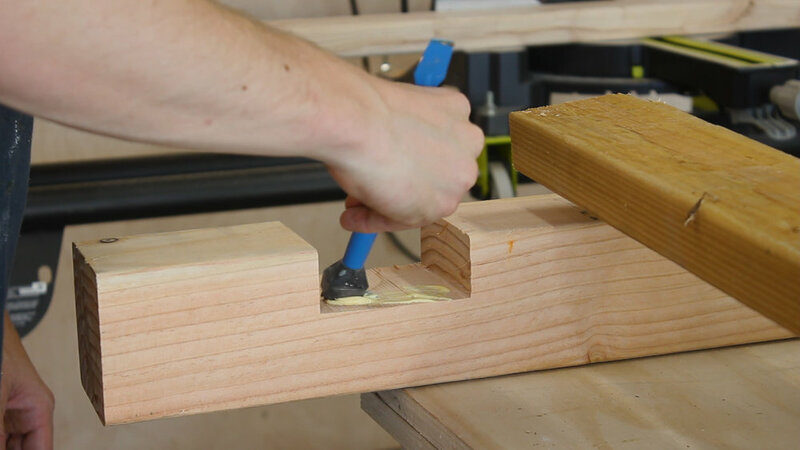 For bottom supports, I wanted to have my stretchers recessed in the legs. Pics 2-3 show me marking and measuring out the space that I'd later cut away with dados. These are for the Outside Dados. Pics 4-5 show me cutting those dados on the miter saw using a miter gauge. Note that I do not have the piece sliding up against the fence - that is dangerous. 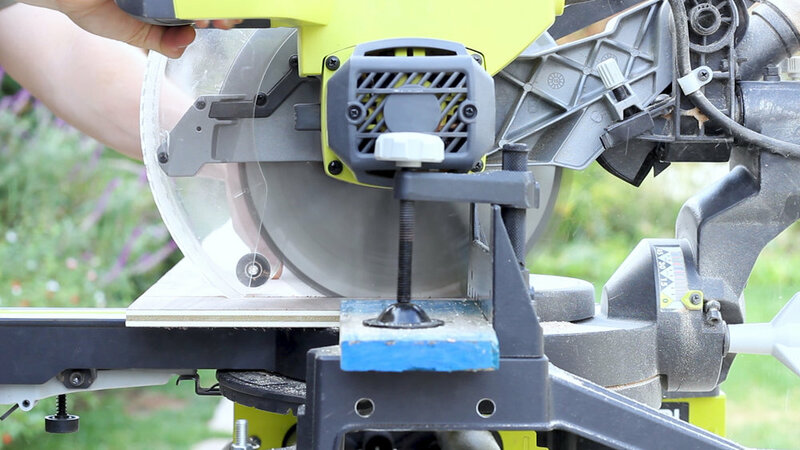 Instead, clamp a piece at the front of your saw where you start, then when you rest your piece up against it, it will be in the proper position. 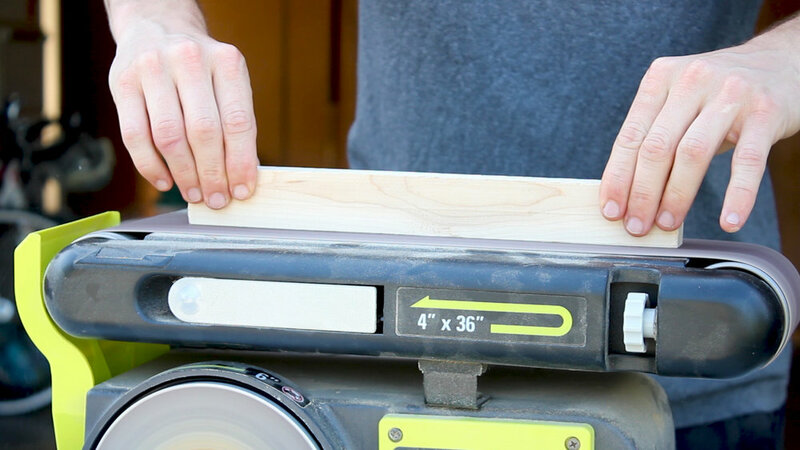 As you move away from it over the blade, your piece will stay in that position against your miter gauge but won't be up against the fence. And I cut them for all six legs (Pic 6). After cutting my dados, I moved to ripping my stretchers to length. 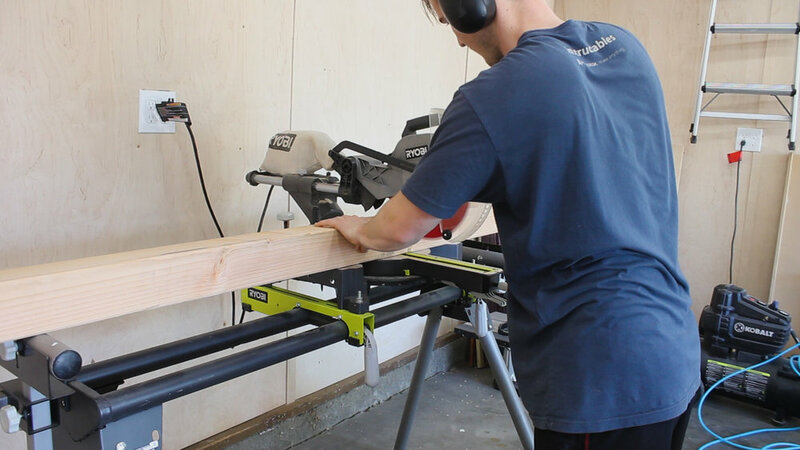 They were around 10' long - I clamped them all together and cut them with a circular saw (Pic 1). I then laid out everything to begin assembly (Pic 2). Three legs per side - I put a single stretcher in the bottom dado (Pic 3) and used a spacer block to line up the piece. 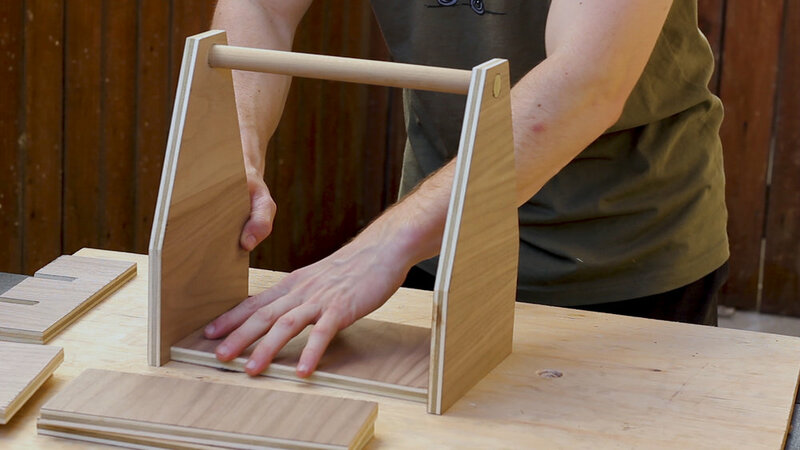 I designed this so the stretcher would fill the entire dado, less the width of a 2x4 which would later be filled with an actual 2x4 for cross supports. I applied glue and used 2.5" wood screws to hold things in place, checking for square in the process (Pics 4-5). I then repeated that process for the other outside leg, and then lined up the middle stretcher (Pic 6) and attached using glue and screws. Pic 7 shows one final full leg support. I cut a bunch of 2 x 4's on the miter saw to specific lengths (in my case I was looking to make my bench about 25" deep on the top) (Pic 1). I then used glue and screws to attached everything together - Pics 2-4 show me doing the top stretchers. Pic 5 shows me attaching the supports at the bottom - you can see here, per my earlier step, why I left the 1.5" gap on the ends, as now I could insert a 2x4 in that gap and bring everything together. Very sturdy! 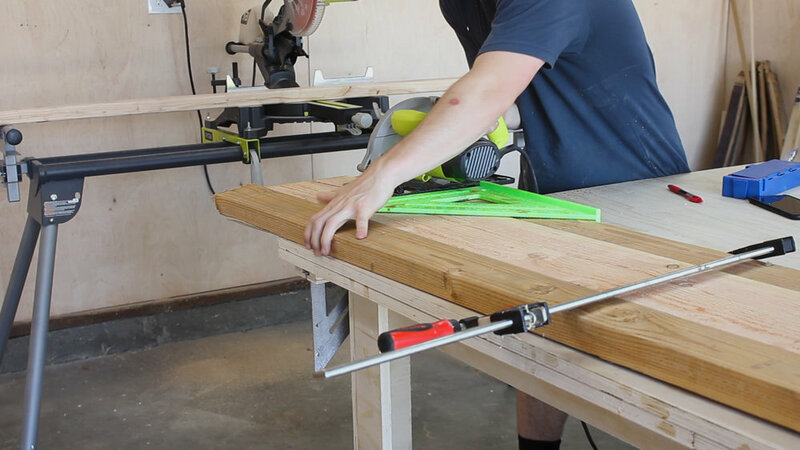 I also cut middle stretchers for the middle of the bench (Pics 6-7) - I had 7 total stretchers on the top and bottom to provide rigidity and support for my work surface. The middle stretchers that were not on the outsides are just held together with screws. My dad and I ripped down our sheet of plywood on the table saw (Pic 1). The top sheet was full length, and about 25" wide - this was purposeful as it left about 23" of width on the remainder of the piece to be used for the bottom shelf. Since the bottom stretchers were on the insides of the posts, it made the lower shelf skinnier than the bench to - so again, this was perfect. I lined up the top surface to the bench and attached it using brad nails (Pics 2-3). I wanted the freedom later on to replace this top with new material if it ever got too dinged up. For the bottom shelf, I needed to measure and notch out places for the 4x4s to go. I did this by measuring the bottom shelf and then cutting out the spaces with a jig saw (Pic 4). And it fell nicely into place after (Pic 5). Since the bench was between 9 - 10 feet long, I needed additional plywood to finish out the top. I cut down the remainder from a second sheet of plywood (Pic 6) and then attached the top and bottom pieces again using brad nails (Pics 7-8). I needed to notch out the bottom piece like I did the other parts, but that was a lot of the same so I don't show it here. 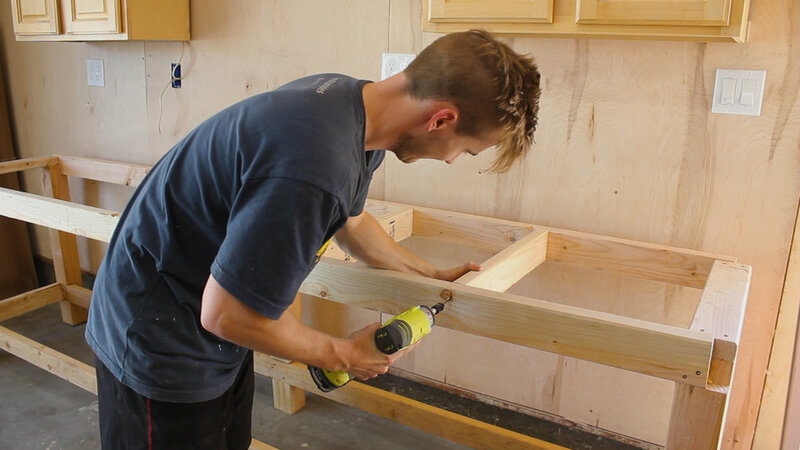 You're left with a 4' x 6' sheet of 3/4" plywood - this is a ton of extra wood - I ended up making a huge clamp rack out of it - so although it felt like I might be way overbuying for this bench, there is nothing like having a huge amount of scraps to make something else that is very useful! After the bench was assembled, I cleaned out the space and wiggled the bench into place. It was really heavy. Once I added all my tools to it, I couldn't physically move it. I decided last minute to add drawers with additional scrap plywood that I salvaged from my parents old TV credenza that they were looking to toss. It was pretty high quality furniture plywood, so it ripped easily on the table saw (Pic 1) and miter saw (Pic 2). The drawers would be 4" tall and were as deep as the bench measured. 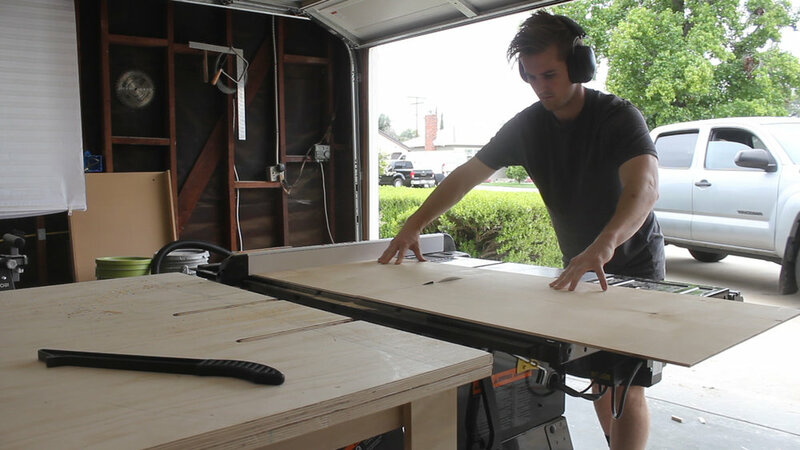 I then cut dados on the table saw to accept the drawer bottom. 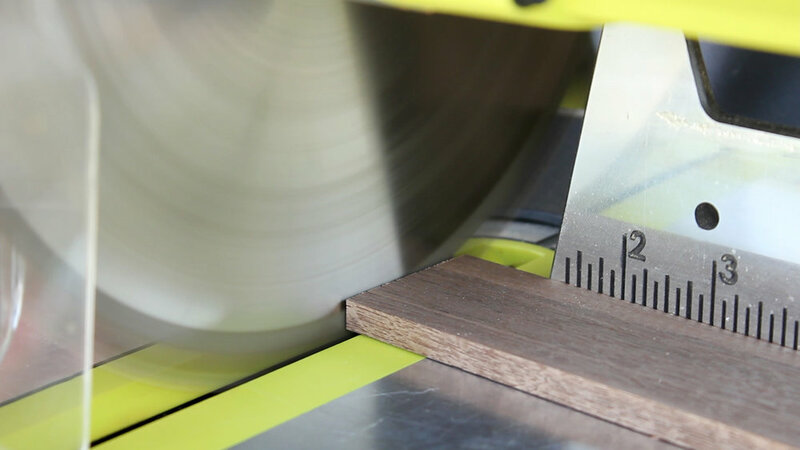 The kerf of the blade makes it so you just need to make two passes on the table saw 1/8" apart - very quick and easy (Pic 3). I then drilled pocket holes for joinery (Pic 4). 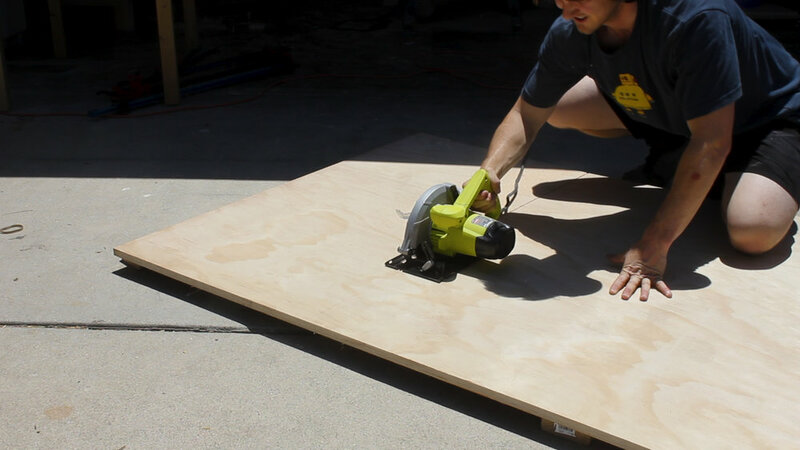 I used a sheet of 5mm 4'x4' plywood for the drawer bottoms that I broke down on my table saw (Pic 5). I then assembled everything - first attaching three sides together (Pic 6), then sliding in the drawer bottom between the dados, and then adding the fourth side. And I repeated that for all four drawers (Pic 7). I didn't want to buy drawer slides - this just felt unecessary and there wasn't really anything for me to mount them too on this bench. Instead, I cut three pieces - a single 3/4" x 3/4" strip that would attach to the top sides of the drawer, an additional strip of the same size, and a strip that was 1.5" x 3.4", the ladder of which would combine to form an L. The L would be mounted to the bottom of the top shelf, and the strip could then be slide into it. Pic 1 shows this set up but upside down - it was really easy and I hope my explanation is clear! Pics 2-4 show me making the "L" pieces. 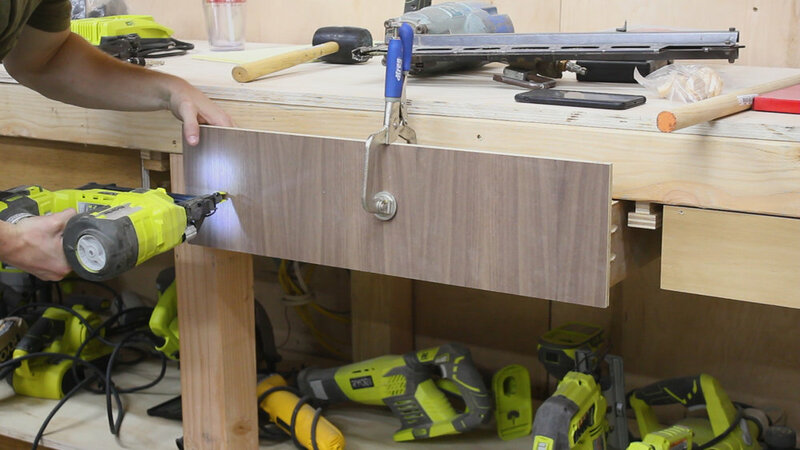 I drilled and counter sunk the holes so that when I glued up and screwed together, the screws didn't split the plywood or stick out and hinder the sliding of the drawer. 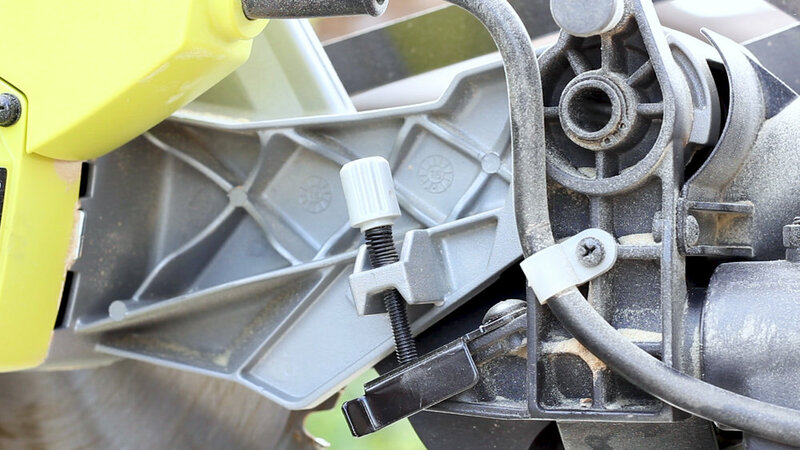 Using little squeeze clamps while attaching screws was very handy. I then repeated the same process for the strips that would be mounted to the drawers, and mounted them (Pics 5-6). I then could mount the slides to the underside of the drawer (Pic 7), and then slid in all four drawers (Pic 8). NOTE - make sure your "L" stretchers are long enough to span the underside of the bench - I almost messed this up by cutting them too short! These drawers were massive - about 2' x 2', and I loved them. I decided last minute to add some false drawer fronts. 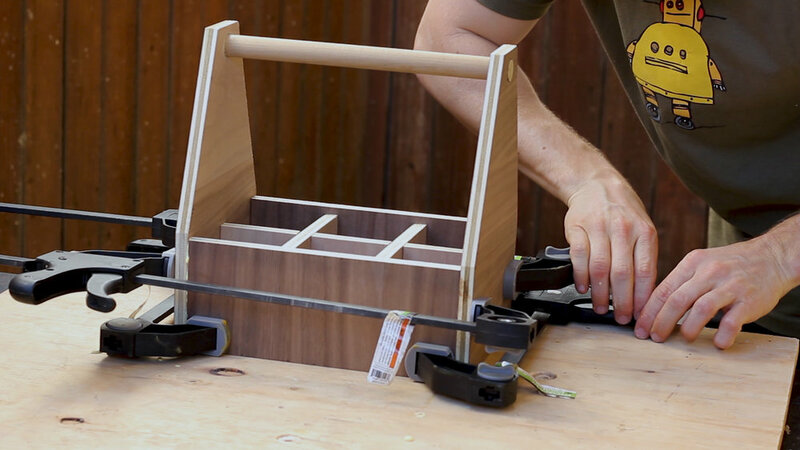 This would make the piece a bit "prettier" and would also prevent the drawers from sliding any further back than they needed too. I used left over walnut plywood from Purebond for this step - but you can just as easily use any type of wood for this - hardwoods, different plywoods, whitewoods, etc. 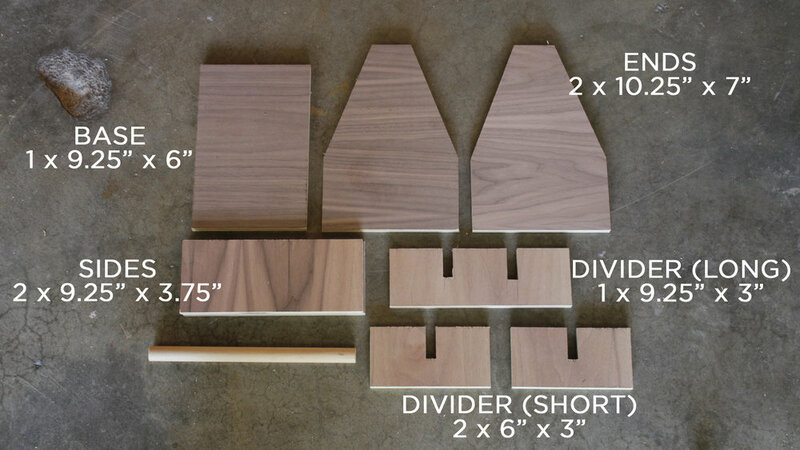 I unfortunately did not have enough material in the right size to make the drawer fronts a continuous grain, but anyways - I ripped down the pieces on the table saw (Pics 1-2) based on the sizes I needed. 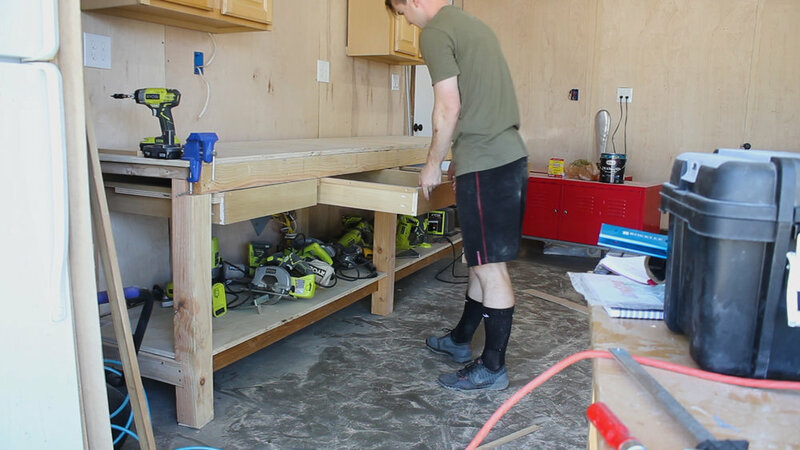 I then clamped into place, leveled off, and attached the drawer fronts using some brad nails (Pics 3-5). I then marked center and drilled pilot holes for some single pine door nobs that I had from left over Ikea furniture back in the day (Pic 6). Then just some screws to attach them (Pic 7). I didn't film me putting on a finish, but I used some cutting board oil just to bring out the grain - I didn't want to go fancy and I didn't want to spend any more time making this thing! You can see how big and robust this thing is with me next to it, how the drawers look, and how many tools it olds. For my fiancé's bridal shower, she received a Kindle Fire tablet for the kitchen. She had been wanting one of these for some time now - as she can use it for recipes, to watch shows, to set timers and alarms, etc. Now, she needed a proper stand for it, so I decided to tackle the project on a whim with some wine oak wood I had. 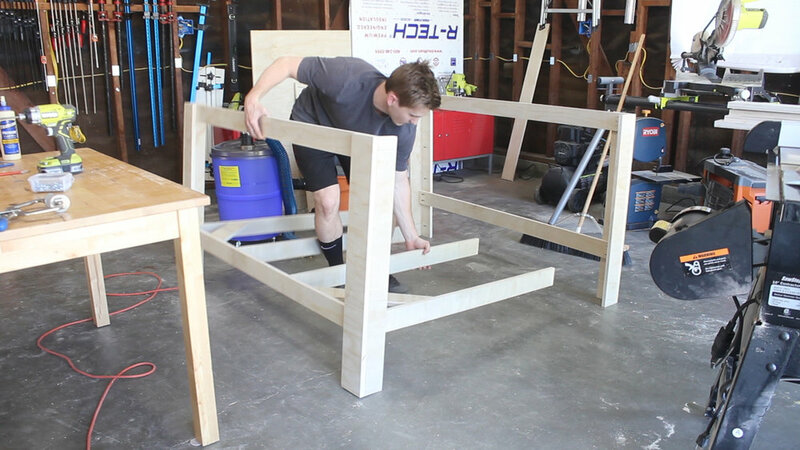 Below is a video of my build, followed by full instructions, including materials and steps. Below are all materials and tools for the project. 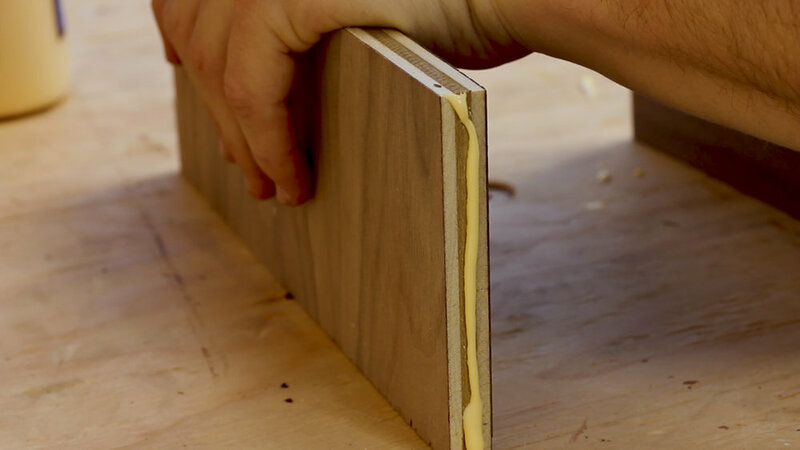 Note - if you have thin strips of hardwoods - you can get away without using a planer - you'll just need an orbital sander to flatten and smooth after glue ups. My father-in-law does wine barrel revival art. He acquired a massive stack of this oakwood that is placed inside of steal vats while wine is fermenting. This allows wineries to ferment wine in large quantities without using barrels but without sacrificing the oak flavor. You can see how in all three pictures the wine is crystalized purple with sugar - it smells incredible. They are zip-tied together in groups of 10 or so - I do not know how many are placed inside of a vat at once or for how long - but clearly these have been in the game for a long time. Underneath the sugar is very nice oakwood that is colored in a beautiful brown after years of being used for wine making. Pics 1-2 show me planing down the sides of each piece to reveal that wood. Pic 3 show the difference in sugar wine v. the oak wood underneath - pretty amazing right? I tried to preserve as much thickness as possible in this step. I don't own a jointer so to get these sides flat I first ran a piece through my able saw - and then checked how much bow there was too it - becuase I don't have a very straight reference this wasn't as flat as could be (Pics 4-5). 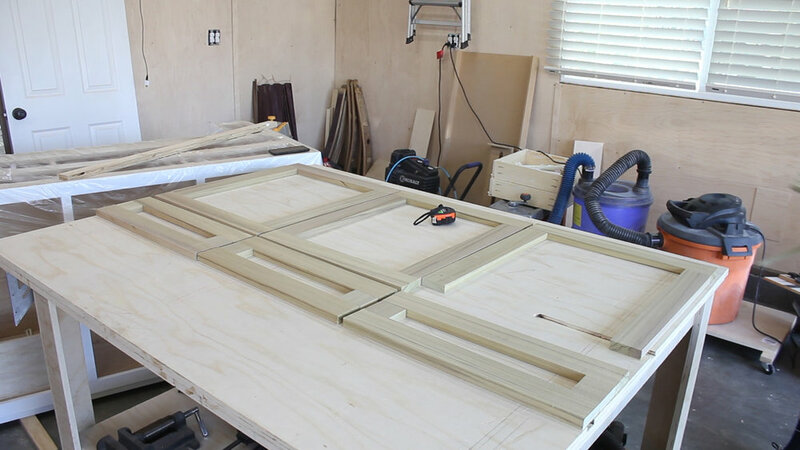 Then, I could flip the piece, run it through the table saw to give me to square sides (Pic 6) and then flip it back over to the original side to square up the side (Pic 7) - so 3 passes in total - alternating each time, to get to a square flat piece ready to be glued up. In Pic 8-9, I cut off the ends of each piece as they had holes cut in them for zip ties, and then cut them in half. This left me with 8 equal pieces (Pic 1) that I could divide into two sets of four - doing some rearranging to get a grain pattern I liked. Then, I could glue them up (Pics 2-3) - making sure glue was spread evenly and that there was a bit of squeeze out in the process. In Pic 4, I used these beefy clamps from Rockler to squeeze cauls into place to keep things flat - the clamps let you rotate the handle 90° so you can get more leverage out of them, and then applied clamps horizontally (Pic 5) to bring it all together - I then let it cure overnight. The next day, I skip-planed down each side of the piece - this was only to clean up glue - not remove material - they were already thin and I didn't want to sacrifice any more material (Pic 1). I then squared up one end on the miter saw (Pic 2), and then went back to my workbench and used my tape measure and the table to figure out a final height for the piece (Pic 3). My thought process was making sure that the height was tall enough to house the tablet when it rested vertically.Then I cut it to length on the miter saw (Pic 4). This next step was a bit of an experiment. 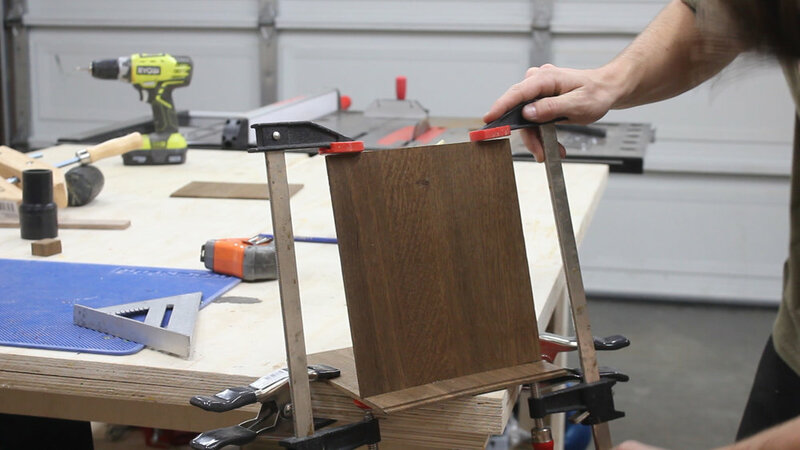 I figured out what angle I wanted my table to rest off camera using a speed square, and then tilted by blade (Pics 1-2) to 15° on the table saw. I then cut the front of the base to have that angle, as well as the bottom part of the vertical piece that would house the tablet (Pic 3). 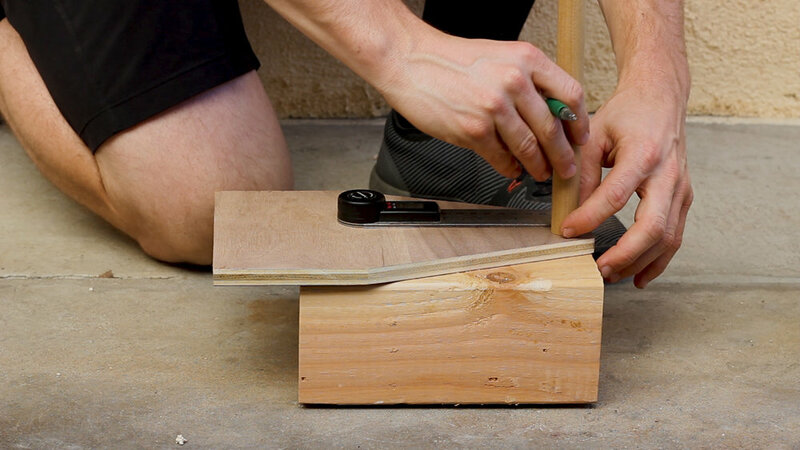 Then, I lowered my blade to half the thickness of my base support and made multiple passes over the blade to cut a dado in the front of the base and one inch back. 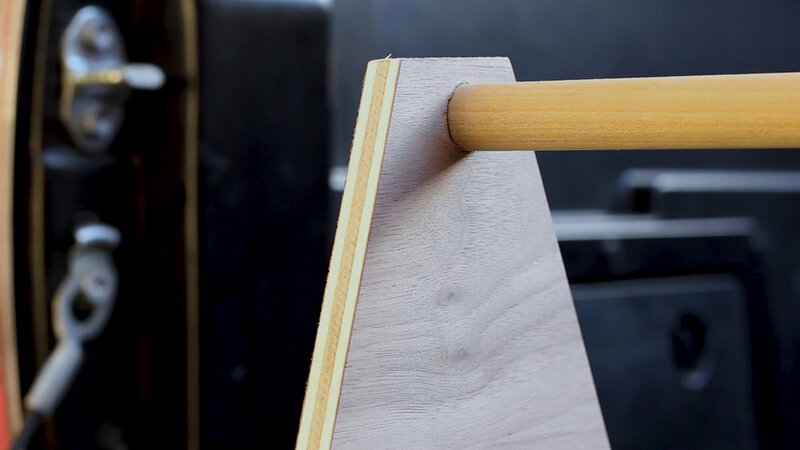 These dados would accept as mall front lip to prevent the tablet from sliding, as well as the back piece that actually held up the tablet (Pic 4). 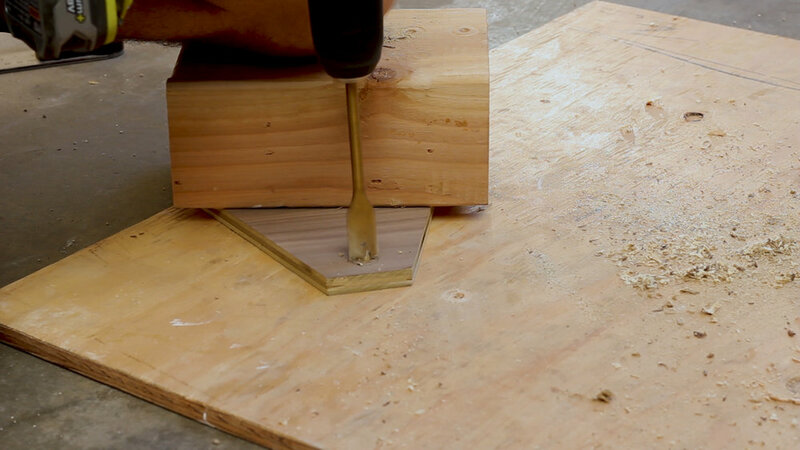 Lastly, I used a chisel to clean up the saw cuts (Pic 5). Before moving on to assembly, I ripped excess oak wood I had glued up and cut off (this is why I ultimately made 2 of these panels in the beginning as it gave me some wiggle room in the cuts to experiment with what the right sizes were without fear of making a cut too short and ruining something. I cut the piece into five strips about 1.25" wide on my table saw (Pic 1), and then glue them together in a stacked format (Pics 2-3). This essentially gave me a thick block of wood to use as support in the rear. I began by gluing up the support piece (Pic 2), using a scrap piece to line it up properly with the middle dado (Pic 3), and then checking to make sure it is square (Pic 4). I then clamped it in place for about 30 minutes to cure (Pic 5). Next I could add in the back piece (Pic 6), which was a little tricky to clamp but I found having the back support piece in place and then clamping both sides down to my work surface worked best (Pic 7). Lastly, I glued in the front piece. This was a bit trickier - I ended up using a little excess block to clamp the front piece too (Pic 8) with a squeeze clamp, and then gently applying other clamps all around it - just enough pressure to not break it or mess things up (Pic 9). Pic 1 shows how everything came together. I thought it was a bit "block" after seeing it in this form. In Pic 2, I tested it out and realized my front piece was about 1/2" too tall and it was blocking the bottom of the screen - no point in having a custom Kindle Fire stand that doesn't fit! I went over to my disc sander and sanded down that front piece, as well as clean up all of the edges to be square and smooth (Pics 3-4). I wanted to remove some of the blockiness of the piece, so measured out and marked an arbitrary angle to give it more shape (Pic 5). I then used my miter gauge set at that angle to make a pass on each side of the piece to cut those angles safely (Pic 6). Lastly, I added a bevel to the back support piece (Pic 7). Again, no set measurement - just trying to give this thing some angles. I used some 320 grit paper in Pics 1-2 to sand down all of the edges and surfaces to their final form. Off camera, I cleaned off the piece with some compressed air. These photos show the results of adding the angled cuts on the back as well as the rear bevel. Last up, I added some food safe mineral oil to bring out the color and grain - and it was beautiful and finished (Pics 3-4)! And then the tablet stand was done. This wood is beautiful and it has such a unique smell to it and the functionality of it in the kitchen will have a daily benefit to us moving forward. It's super fun to take something old and turn it into something you'll use everyday! This was above and beyond the most ambitious project I've ever tackled. I'm grateful to have done it, so proud of the final result, and happy to share my process. Full video is below, followed by all the tools and materials I used, plus full steps in the article. The main structure of this was built with 3/4" plywood - 2 sheets to be exact. Pics 1-3show me breaking it down into the various components for my build. The design of my island would have three drawers and cabinets on one side, and a 12" recessed area on the other side for two stools, and would measure 3' x 5'. Pic 4 shows my final cuts for the structure. 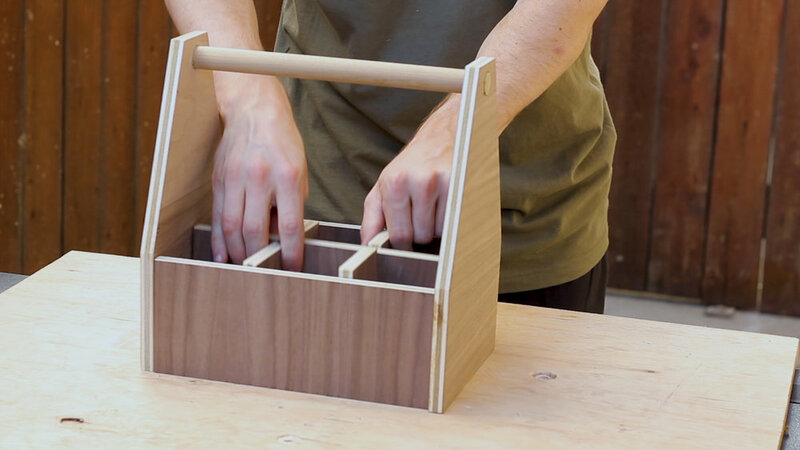 Everything on this project in terms of structure is held together with pocket holes. I think I drilled an used around 200 1 1/4" pocket hole screws for this build. 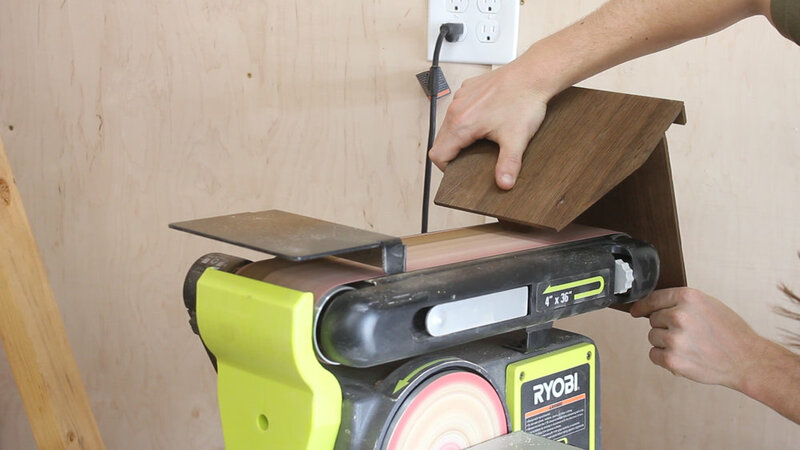 I use pocket holes for nearly every project I work on, and highly recommend the tool! Pics 1-4 show me drilling, gluing, setting in place, and using my impact driver to assemble. I was careful to keep everything as square as possible in this step - this really wasn't the project to rush through! Pic 5 shows one of the two legs that would help form the recess for the two stools - I used a scrap block to help keep the spacing even and not "cup inward". Pic 6 shows me cutting horizontal stretchers (all at once to keep even) that would go across the top and bottom to properly space out each side and add structural support. Pics 7-9 show me using more glue and screws to assemble final pieces of the framing. This wasn't hard - it just took a while and some careful measuring to get everything precise and in it's place! 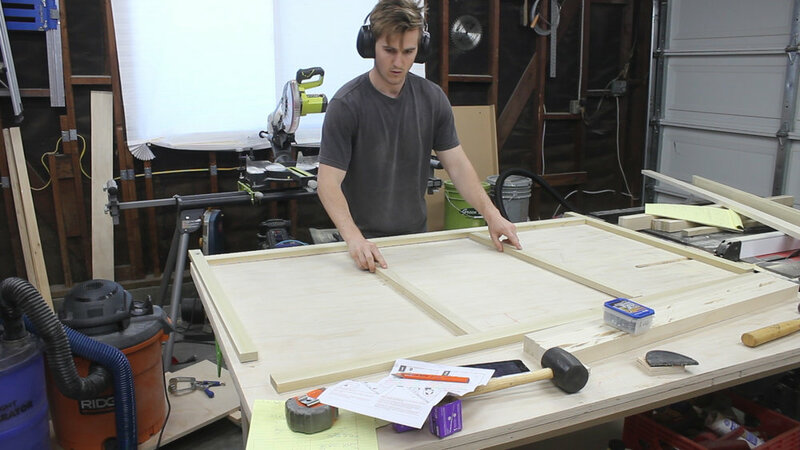 After getting the framing together, I divided the piece into three even quadrants (Pic 1) and ripped additional 3/4" in plywood on the table saw (pic 2). Pic 3 shows those two pieces in place after I used glue and screws to evenly attached. 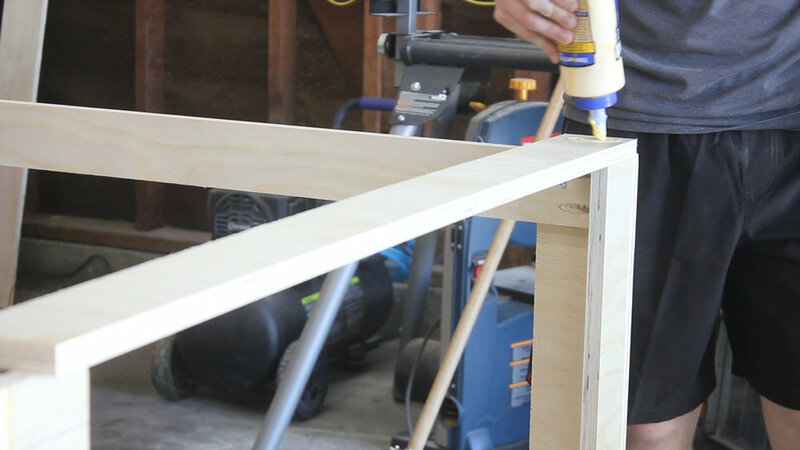 I'm also attaching a few horizontal stretchers in the same piece that will serve as dividers between the cabinets and the drawers. Pics 4-6 show me using small strips of 3/4" plywood and pocket holes to glue and screw in place at the base so that bottom shelves could be attached on top. 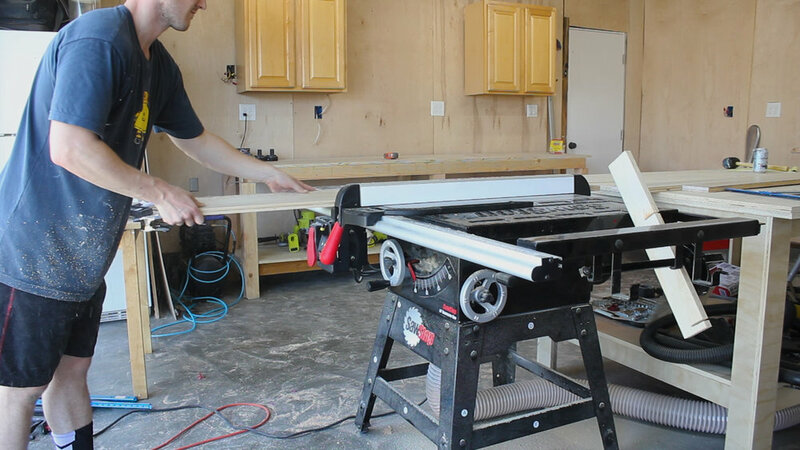 The next step was super easy - I took 1/4" plywood and ripped it to length and width on the table saw (Pics 1-2) and then attached into place - the relative sizes of each piece of plywood are based on the relative size of your bottom shelves - I think mine were around 18" x 20" each. Then, I attached everything using brad nails (Pic 3). My fiancé wanted one of the cabinets to store really large cooking sheets - something that just isn't readily available in most kitchens. 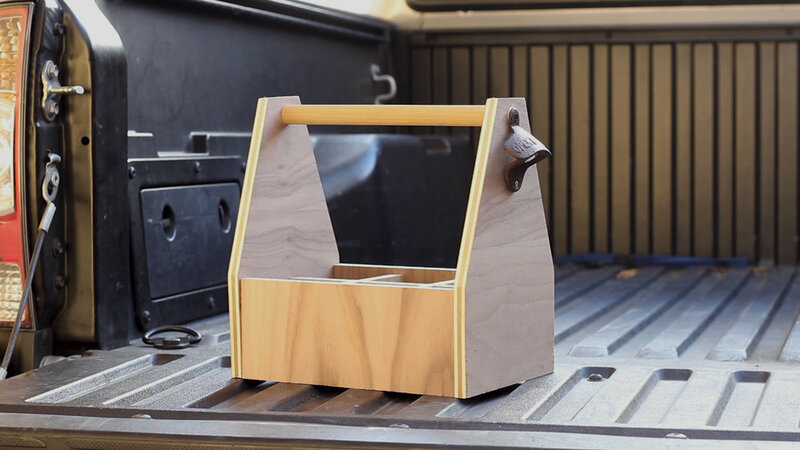 Part me also thought it could store a custom cutting board I build down the road, so I was all for it. To make these, I broke down more 1/4" plywood on the table saw into two sets of wood (Pic 1). The first set would serve as base and roof dividers (Pic 2), while the second set would serve as the actual dividers (not shown, but featured in Pics 6-7). I applied glue and then started laying them in place (Pics 3-4). I did so by using another scrap piece to properly space them. I then used brad nails to tack things in place (Pic 5). Look - drawers are super boring, so I'll spare you. In Pic 1, I used left over 3/4" plywood from the structure to rip two sets of drawers that were about 4.5" tall. Then, in Pic 2, I lowered my table saw blade and made two separate passes to cut rabbits that would hold the bottom shelf later on. To elaborate - my blade is 1/8" thick, so I made one pass with the blade 3/8" high (half the thickness of the plywood), then moved the fence over 1/8" inch and made another pass, giving me a 1/4" rabbit to insert the bottom drawer shelf later on. I then drilled and used pocket holes to assemble the shelf (Pic 3). 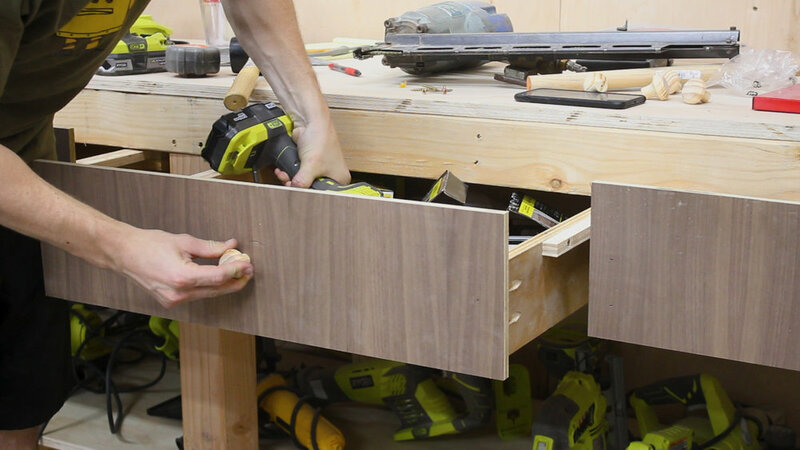 After cutting my bottom shelf (1/4" plywood) to length, I inserted it into the rabbited joints (Pic 4), then attached the fourth side of the drawer (Pic 5) and closed it off with pocket holes. Last up, I added drawer slides to each side, using a spacer block that I cut to keep things parallel and even on each side (Pics 6-7). I hated this part, but it was necessary (obviously!). Pics 8-9 show me installing the subsequent drawer mounts (also not fun, but necessary!). 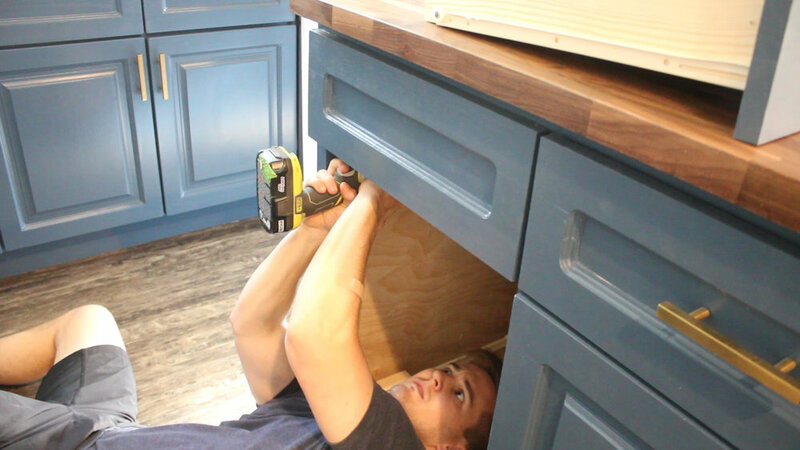 Most cabinet furniture have what are called "face frames", which are really just nicer hardwoods used to give your cabinets a face frame and cover up the layers of plywood. 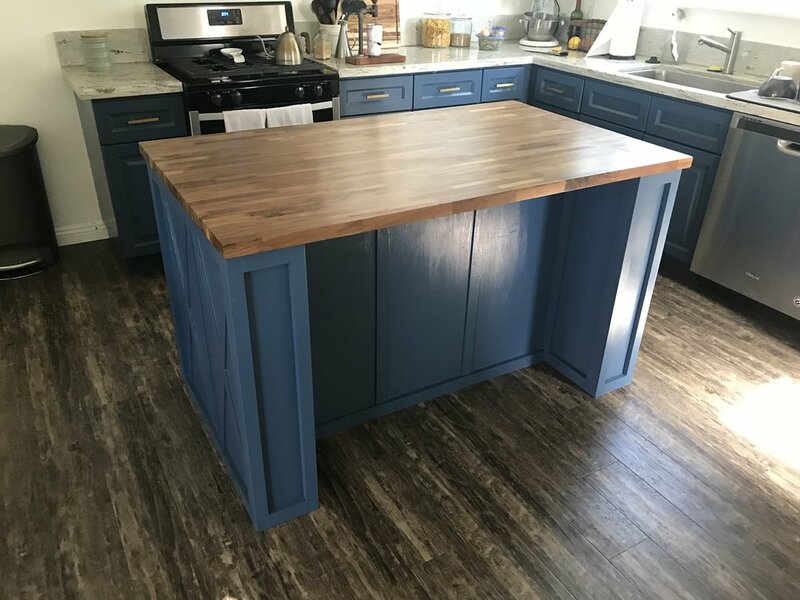 I always planned on painting my island, so using four-quarter poplar was perfect for my needs. I started by ripping all of my material into 1 1/4" strips (Pic 1), and then cut all of my pieces to length on the miter saw (Pic 2). This was entirely relative to my own island, so no need to bore with measurements, but be assured that I took my sweet time measuring out exactly how much material I'd need, the exact lengths I'd need, and how it would all come together. Pic 3 shows me laying it out to make sure I had everything for the front side of the island (the side with the cabinets). Pic 4 shows me using pocket holes to begin assembly, with Pic 5 showing me using glue and pocket hole screws to assemble the pieces. These screws were all on the backside of the material, so they'd be totally hidden. 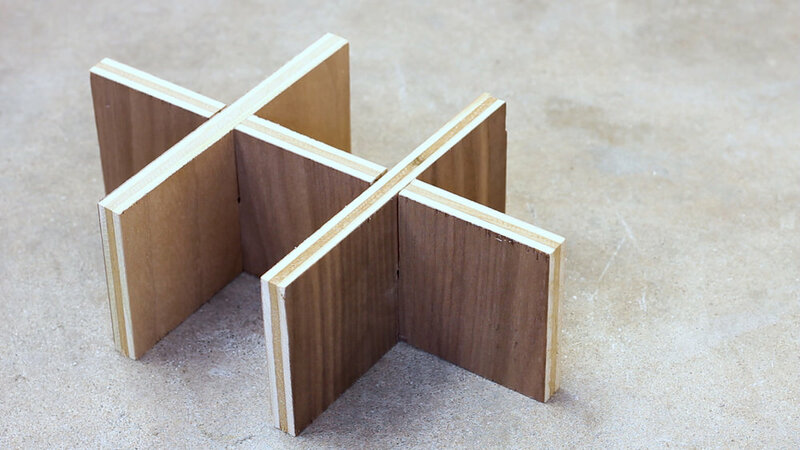 Much YouTube research would tell me that this is a very common way to assemble face frames. Having a big flat even surface to work on and clamp things down was imperative (Pic 5 again). Pic 6 shows me checking to make sure things were even. 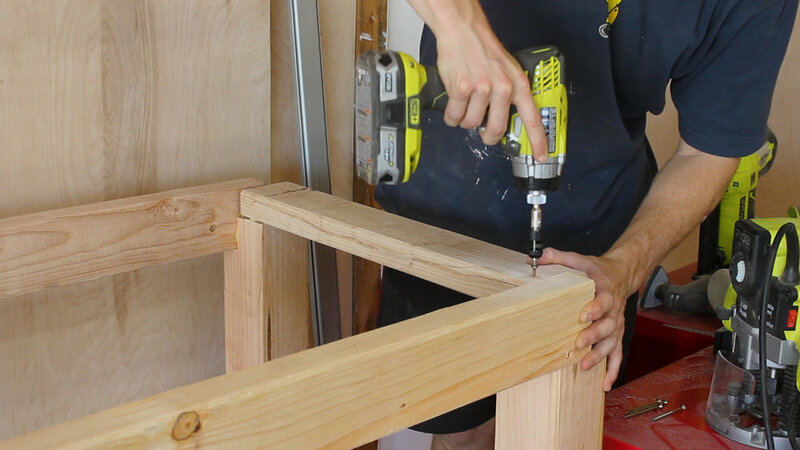 This step was so important for the build - basically, if you start with one side that is basically perfect, you can then do all subsequent sides one after another and things should remain perfect and fall into place properly as you can do them one at a time. Pics 7-9 show me using glue and brad nails to hold everything in place. NOTE - I would not recommend using brad nails to tack things in place unless you plan on painting your island as you'll see them and it will look bad. Since I planned to paint this, I knew I could use wood filler to fill in all holes and cover up later. As I said before, once I had my front faces in place, each piece after was relatively easy as I could use my front side as a reference point and work my way around the island. By doing things one at a time, each side fell into place and things actually somehow ended up pretty damn perfect. Pics 1-2 show me doing the backside of the island (the recessed area), using clamps, glue, and then brad nails to get things perfect. I then went back with food filler in Pic 3 to fill in around 80 brad nail holes, followed by sanding with 120 grit sand paper against a wooden block to flatten everything (Pic 4). The result of this was perfect. Pic 5 shows something that actually kind of looks like an island! Beyond the hardwood face framing I just walked you through, we wanted our island to have additional accents to it - mainly - in the form of pronounced "x's" that stuck out past the plywood but not as far as the hardwood framing. 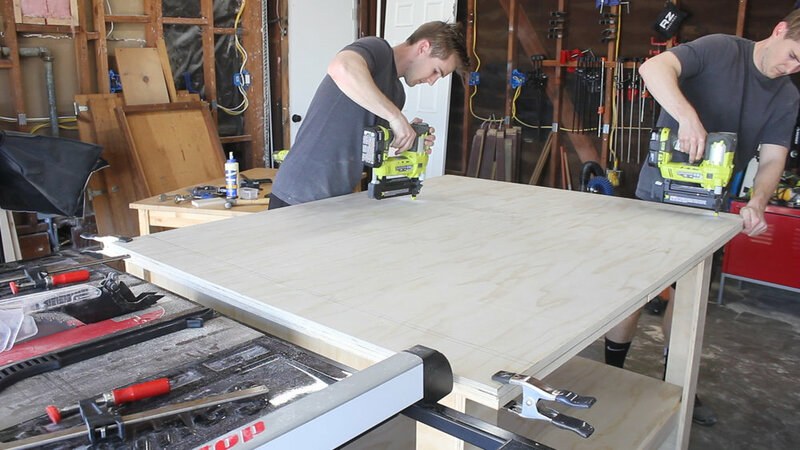 To make this, I cut up the rest of my 1/4" plywood on the miter saw and table saw (Pics 1-2) to about 1" wide and roughly the lengths I'd need for the build. Then, in Pics 3-5, I could begin tacking in place each piece. Our design called for a middle divider on each side, with two x's on each side of it. Starting with the middle divider gave me even sides to measure and work from. Pics 6-8 show me then (as best I could), measuring out, cutting on the miter saw, and then using the stationary disc sander to refine the angles needed to fit x's into each side. I then repeated the process of using glue and brad nails to tack things in place in Pics 9-10). Pic 11 shows the final result of a few hours of careful measuring, cutting, and gluing in place. Pic 12 shows me adding two more vertical pieces on the face of the recessed side - I have no reasoning for this other than I thought it would look cool. It did. 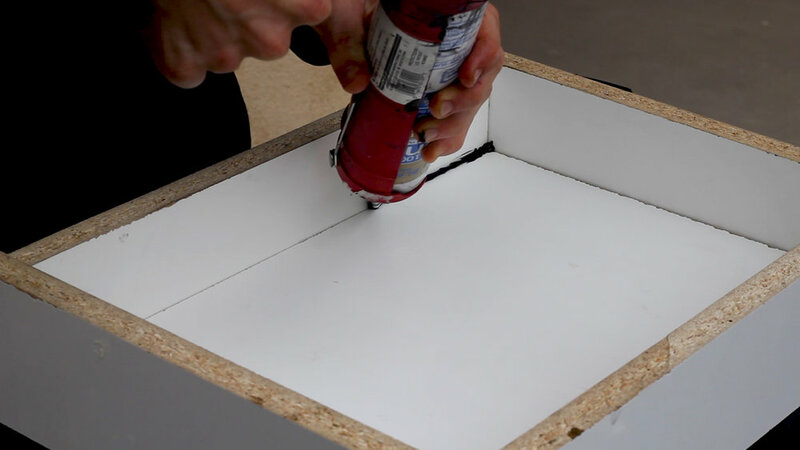 NOTE - I would use thin hardwoods if you are not painting for this step - I only used hardwood plywood because I planned to paint this and thus could cover up any exposed plywood. Then, I primed (one coat) and painted (two coats + touch ups) the entire island using a fine foam roller and a nice paint brush. The hardest part was getting into all the corners. I need a spray system. My fiancé and I agreed that if I could match our current kitchen cabinets (not exactly a simple design!) 80% of the way, then we would be good. Buying cabinets, especially bespoke ones, is damn expensive - like $100 per cabinet. I build my entire set for under $100 and they are damn good (for me). Part one includes me ripping poplar on the table saw (2.25" wide - Pic 1), and then cutting things to length on the miter saw (Pic 2). I bought, ripped, and cut enough material for three cabinets and three drawers. Then, I drilled more pocket holes. For this step, my plan was always to go back after and route a rabbit on the backside of each hardwood frame, so I laid out my pocket holes into places where the router bit wouldn't hit it later on (Pics 3-4). Pic 5 shows how all six cabinet/drawers looked framing-wise. Then, I assembled everything using glue and pocket holes, using a speed square to keep things square and the clamp to keep things flush (Pic 6). 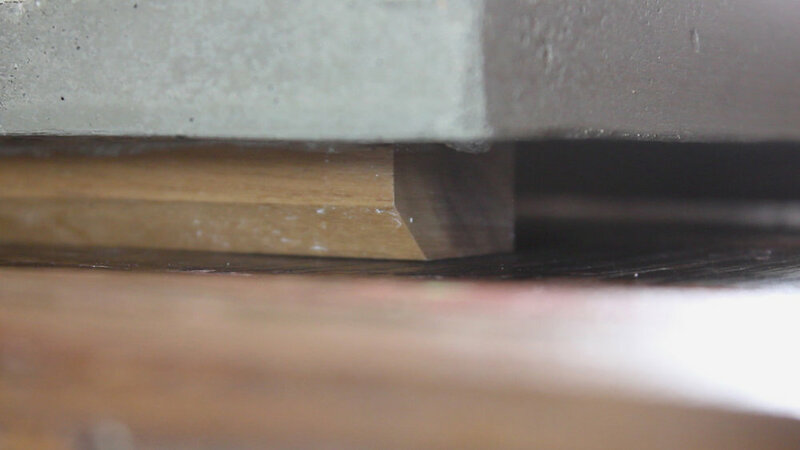 Pic 1 shows me using a rabbit bit on my plunge router to route a groove on the back of each cabinet (as seen in Pic 2). 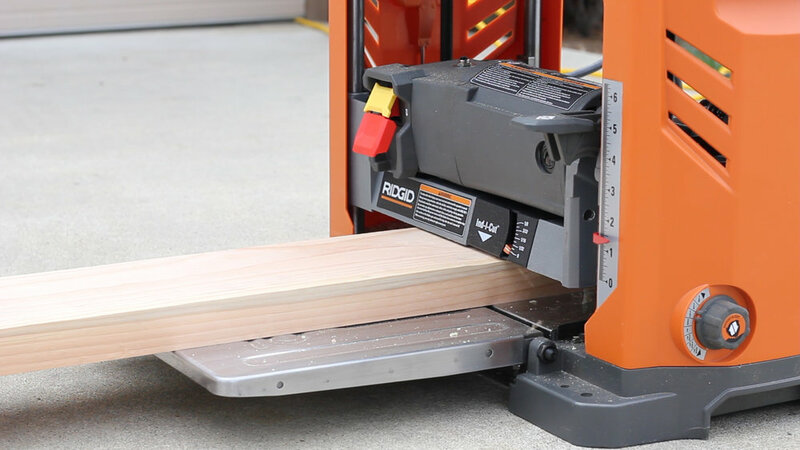 This would be used to accept a piece of 1/4" plywood to fill in the cabinet face. 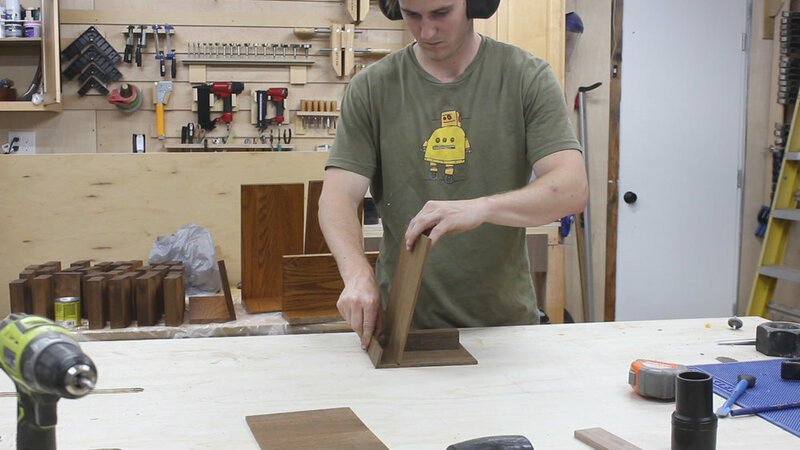 Pic 3 shows me using a special router bit on the front side of the cabinet frame to give it a nice curved profile. This was close to what my cabinets looked like - but not exactly - I simply don't have the tools to make it look perfect. Again - compromise. Pic 4 shows that as a final result. Pics 5-6 show me using fine grit sand paper to smooth things down a bit compressed air to clean things off. 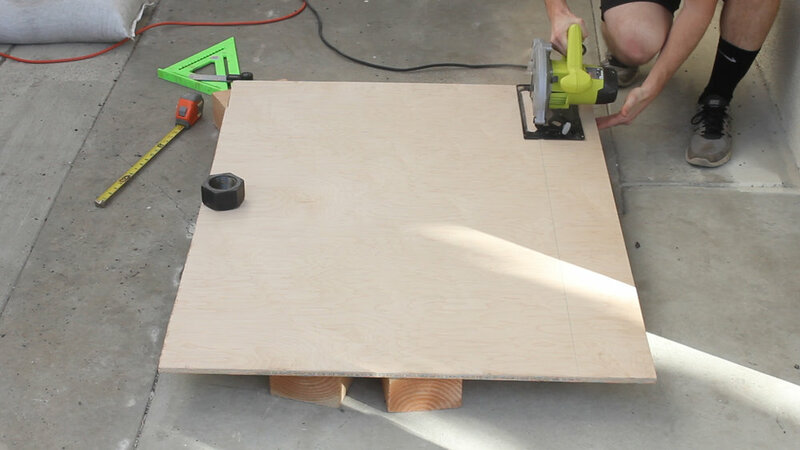 To fill in the space between the hardwood frames, I cut 1/4" plywood down on the table saw (Pic 1). These filler pieces would go on the backside of the frames in the rabbits I cut in the previous step. Because the rabbiting bit left curved corners, I needed to round over the edges on the stationary sander (Pic 2).Then, using glue and squeeze clamps, I could glue everything in place (Pics 3-5) and let cure for 3-4 hours. The current drawers in my kitchen are made up of just a hardwood frame and a middle piece - there is no added profile in the middle that is elevated. 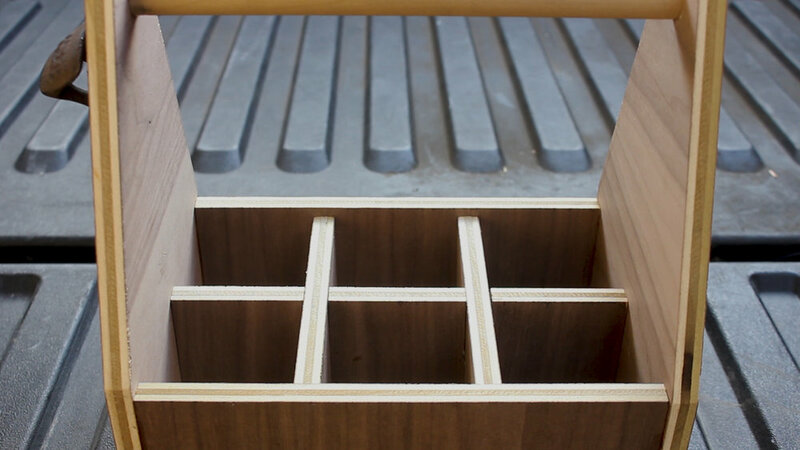 However, the cabinets have a hardwood frame, a 1/4" backing, and then a middle profile. So I needed to make that for the three bottom cabinets. Pics 3-4 show the final profile, me laying it out and measuring properly for evenness, then using glue and something heavy to glue them down - no finish nails for this step. 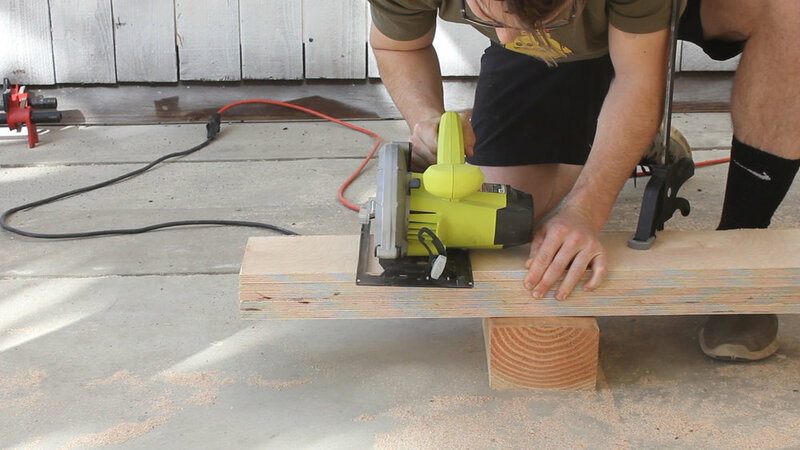 Look, I can make things, and I probably could have made this butcher block top. But there is a risk/rewards thing, and I don't have too much pride to risk hundreds of dollars on nice hardwood only to mess it up later on. Could I have made this myself - yea, probably. Did I want to? Kind of. Do I regret buying it. Hell no. All in all, I paid about $850 total for this island - $550 being this walnut butcher block. 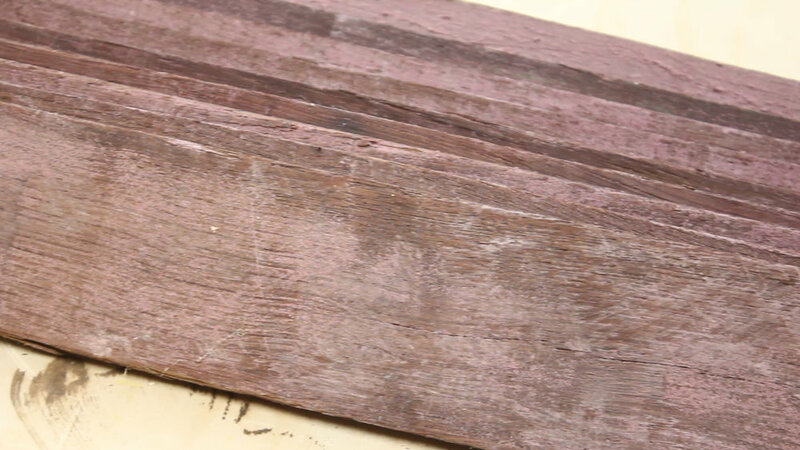 The block was bought from a website called Perfect Plank, and I realized that buying and having this shipped would have cost about the same amount to buy the raw materials. So yea, worth it. The block comes sanded to 120 on one side (Pic 1), so step one of this (Pic 2) was to sand up to 300 grit as well as break the sharp edges. Then, after cleaning off all sawdust with compressed air (not picture), in Pics 3-6, I used Emmet's The Good Stuff butcher block finisher to finish it. You rub in the goop in a circular fashion, working it into the wood, then come back after 15 minutes and wipe off excess using a straight motion that runs with the grain. Few tips I got for this. First, finish all 6 sides of the block at once as to avoid uneven exposure to elements which could cause cupping and/or warp. 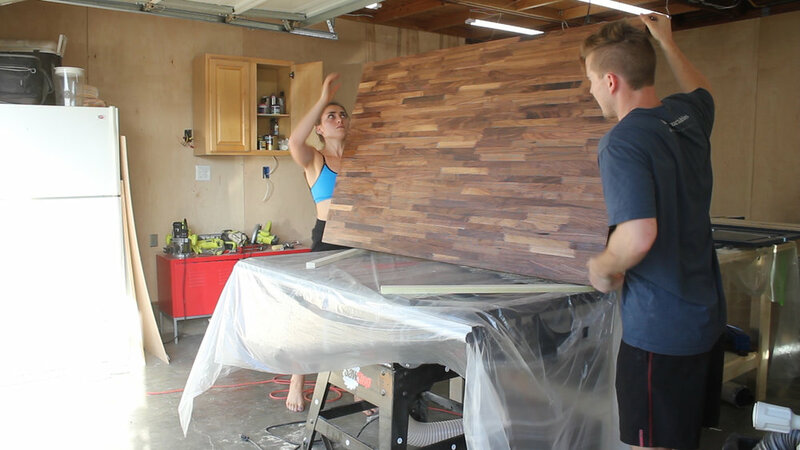 Two, don't spray water on the unfinished wood to raise the grain - that can also lead to warping over such a large surface. I headed their advice and did everything they recommended and it came out freaking perfect (Pic 7). I did go back after 12 hours, sand down with 400 grit lightly, clean off with a damp rag, and then apply one more coat of the finish in the same fashion as before (not pictured). This wasn't very fun and I dreaded it.Pic 1 shows me installing the trashcan slide from the backside. I made this little base out of scrap plywood and attached using 1 1/4" inch pocket hole screws, and then attached drawer slides to the boarder. Pic 2 shows drilling a recess in the back sides of the other two cabinets that would accept hinges. This was nerve racking, but worked out in the end. I then pre-drilled, screwed in, and attached the cabinets to the hardwood framing (Pics 3-5). 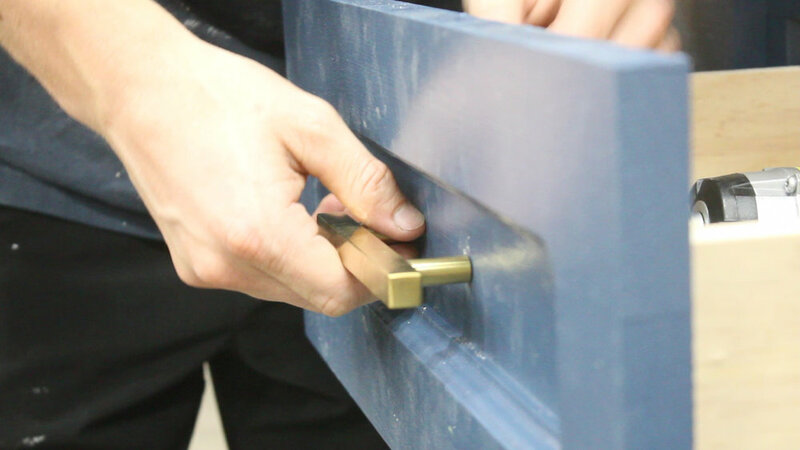 Buy new hinges - I used old ones from a kitchen remodel and although they worked, newer hinges allow you to install and adjust things on a micro level to get even. With mine, I had no wiggle room, so I had to be extra precise. Pic 6 shows me putting in the trash can drawer. Last up was to install the drawer faces. I carefully mesaured out the centers of each drawer using a drywall square and speed square, and then used a punch to mark the locations for holes (Pic 1). It also helped having one set of hardware on hand to confirm your measurements were accurate. Once I did, I pre-drilled holes to accept screws (Pic 2). To hold drawers in place, I used hot glue and pressed the drawer face up against the drawer itself, using a spacer to keep things even (Pics 3-4). 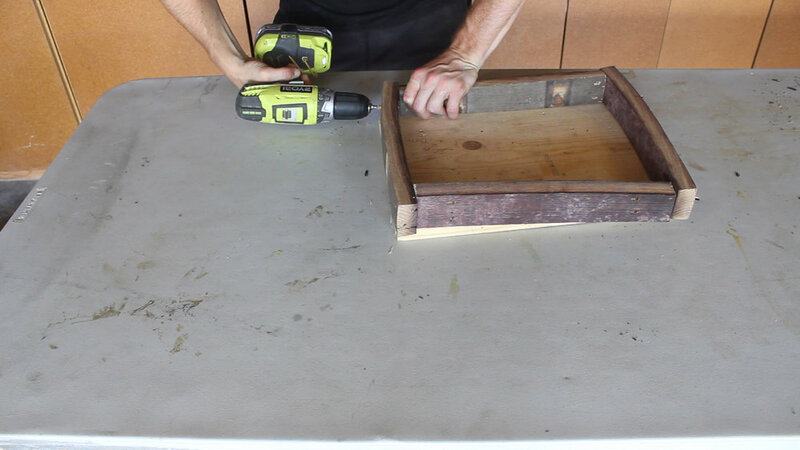 I then could use the same pre drilled holes to drill through the drawer faces and through the drawer (Pic 5). Finally, I could attach drawer handles from the reverse side using the hardware included in the kit (Pic 6). I repeated this process for the cabinets below and the trashcan in Pic 7 (easy peasey!). I built my island knowing I could physically move it to its final home. If you don't have a way to move something that is 3 feet wide (Like having double french doors in your backyard - Pic 2), then make sure you account for what you can actually fit!. My dad and I took the long journey from my garage / shop, around the house, to the back, and into the kitchen (Pics 1-3), and then sat it in its final place. This thing is so dang heavy, I have not and do not plan to actually mount it to the floor. In Pics 4-5, we then moved the butcher block to it's final place. This thing made it even heavier - at this point I could lean and push my whole body against it and it didn't move a millimeter. By the way - seeing this beauty in it's near final state in our kitchen was amazing. To attach the butcher block to the island, before moving into the kitchen, I drilled four holes in each corner top support piece that was 1/2" wide (Pic 1). To actually attach base to block, I'd am using a washer and pocket hole screw (Pic 2). 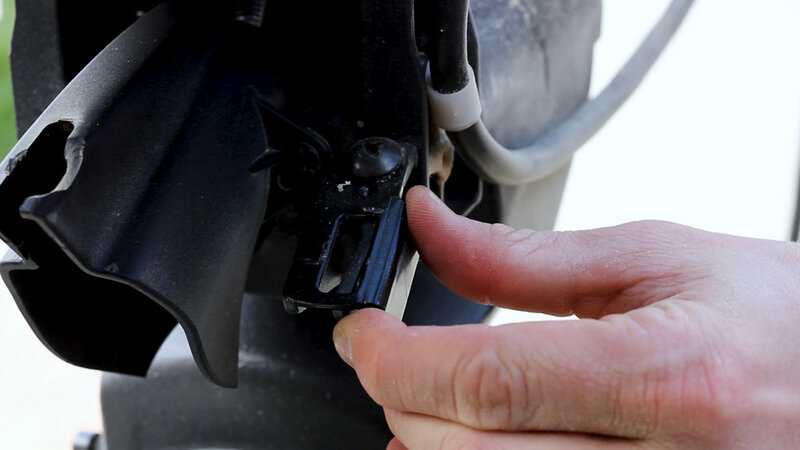 Drilling a hole larger than the screw and using a washer allows for expansion and contraction as the weather changes throughout the year (advice from my father in law). Pic 3 shows my fiancé and I marking and measuring the final location of the block. Pics 4-5 show me using my impact driver to drive in the final screws. AND THEN WE WERE DONE BABY! I could not be more excited about this thing. It is just awesome and I'm going to go ahead and pat myself on the back for building something I never knew was possible (in my own skill set). I encourage you to get out there and tackle things outside your comfort zone - cause damn is the payoff amazing. 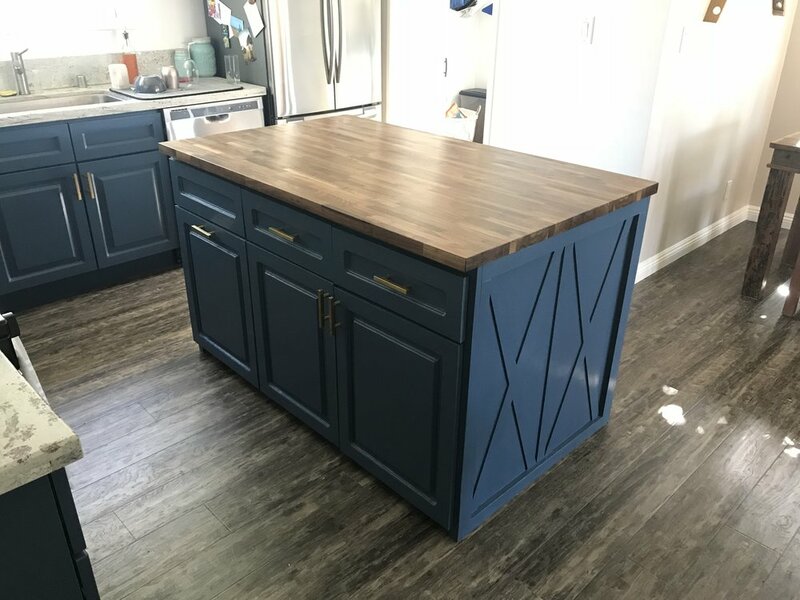 Take a look at the final pics, as well as the last two which show a before/after of our kitchen space (why was there no island there to start?!?). PLEASE SUBSCRIBE TO OUR YOUTUBE CHANNEL BY CLICKING HERE. 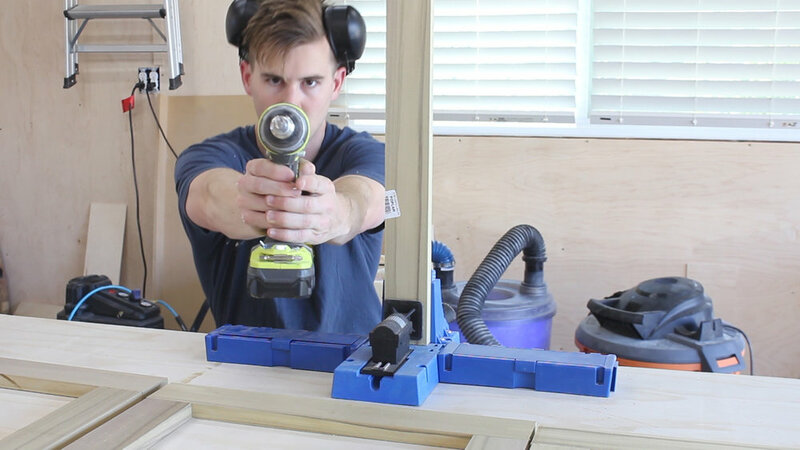 My full video of the build is below, followed by detailed instructions with tools, materials, and measurements! To begin, I found the highest resolution and most "clear" photo I could find of the gauntlet online. 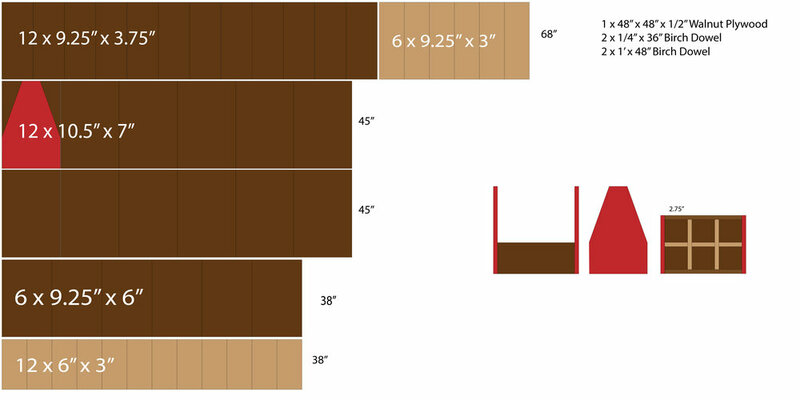 I then brought it into Illustrator and sized it to fit in section of blocks that were a little under 1.5" thick (knowing that I wanted to use a 2 x 8 for this project, and that I'd plane it down to something about 1.4" thick). 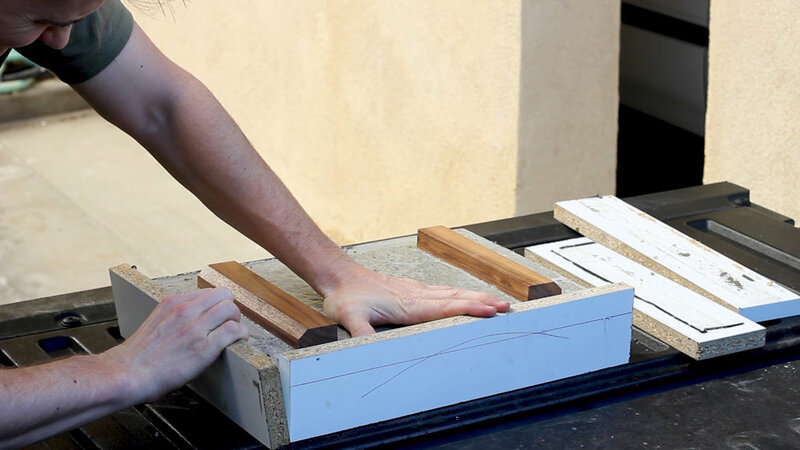 his is not necessary, and I ended up skipping this whole bit the second time around, but if you want to be able to stick your hand in your design, you'll want to cut out holes in the first 9 pieces before gluing up. Pic 1 shows me figuring out how many pieces I'd need to cut out a hole in. I used a masking tape ring to make a rough circle in Pic 2. Then, in Pics 3-5, I used a drill and jig saw to cut out holes in each of my pieces, using clamps to hold it steady while I did so. Pic 6 shows me test fitting my hand before gluing. hen, using some Titebond II in Pic 1, I applied an even amount of glue to all the surfaces of each piece for lamination. I used my template in Pic 2 to make sure the pieces were lined up, and then clamped it together and let it dry for 24 hours in Pics 3-4. Simple enough. 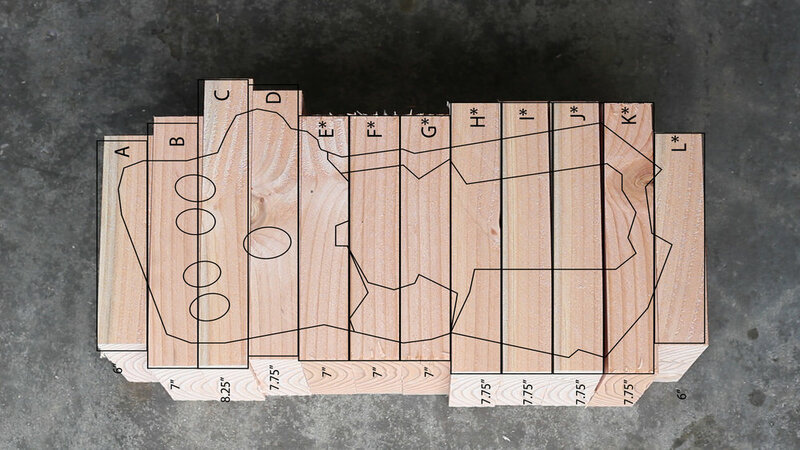 All of these steps could be skipped if you somehow had a big chunk of wood to carve down (like a tree stump, etc.). originally planned to use a band saw from my buddy to cut out the outline, hence why I designed the entire thing to be the size it was (so it could fit in the cutting capacity), but it turned out to be too much to handle. So, I used a chain saw instead, which worked much better and was faster anyways. fter chainsawing, I switched to my angle grinder and a TurboPlane to power-carve (Pics 1-2). To smooth things out, I used a 40 grit flap disk (Pic 3). These are wonderful, and are an absolute necessity when power-carving. I suppose if you were just trying to create your own take on the glove, then it would be fine, but I wanted mine to be relatively "movie accurate", so I ended up wasting a lot of time trying to fix the problem before just calling it quits and starting over. s I said in the previous step, I had pretty much botched the carving job. Rushing, not checking my references, and just thinking that I was on the right path all culminated in something that didn't come out how I was anticipating it. 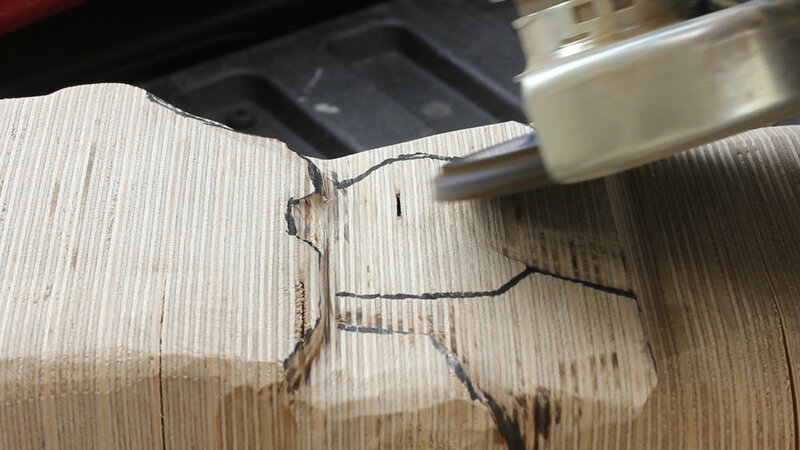 That is the tricky part of these carving projects, especially when you design something in 2D and need to translate that into 3D - you do need some sense of artistic design and spacial understanding because once you remove the material, there ain't no goin' back! Pics 1-2 shows how I designed that. Each main component of the glove layer would have a number associated with it, which would tell me, in terms of layers, how "outside' or "inside" it would need to be. Having redesigned the the gauntlet in Illustrator to be made from 1/2" plywood that I got from Purebond, I got to work. I cut out the squares in Pics 1-2 from a scrap piece of 1/2" spalted maple plywood I had, and then laminated all 30 of the strips together in Pic 3. 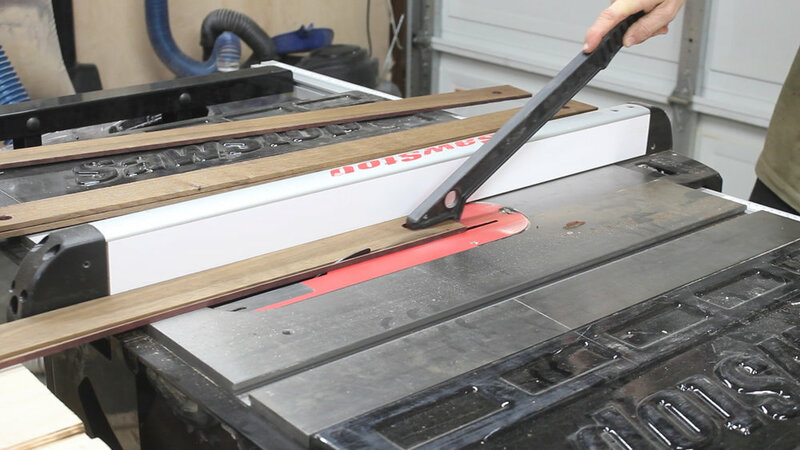 This actually works better as you don't need a table saw or a planer to get to nice clean cuts for laminating. Pics 1-2 show me repeating the same method as before. I glued on my template to the piece of wood, except this time, as I didn't have a chain saw, I power-carved everything. 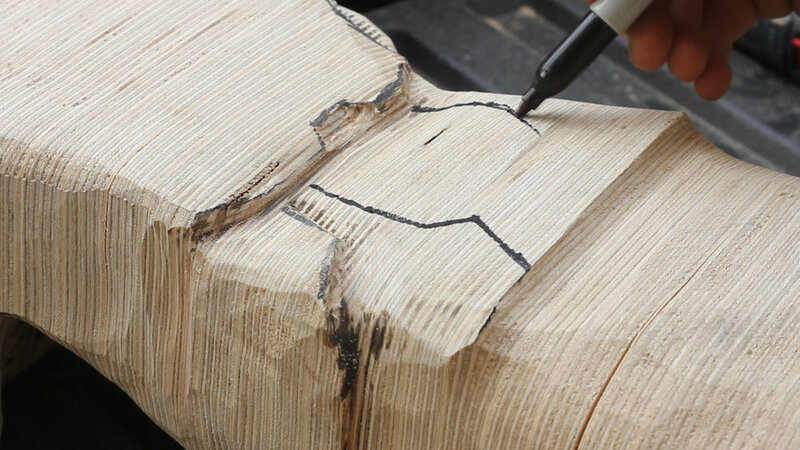 In Pic 2, you see my carving out the hand portion of it - I was VERY methodical and careful about this part, stopping frequently to check that what I was carving looked both like a true hand as well as what my reference photos looked like. Remember, you can't put back material once it is gone. Pic 3 shows the glove after the first round of carving (before detailing) - already 100x better than before! Pics 4 -5 show me using a forstner bit to separate the thumb and fingers (only way I could think of as I don't have a ball gouge or any other tool to get in those tight spaces, and then a dremel bit to separate the fingers. 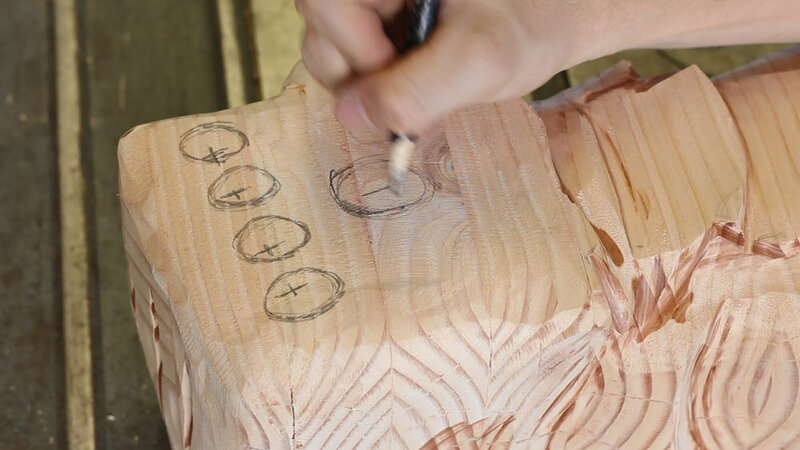 Pic 6 shows the early stages of carving the preliminary "armor" layer (more on this in the next step). Pics 4-6 show me using a flap disk and dremel drum sander bit to carve out the armor of the fingers (my own design), round over the edges, and add more detail to the main gauntlet armor.This took about three hours, as again, I took it slow, referenced my photos and designs frequently, and in general, took the time to get all the shapes right. I was stoked on the result. To finish it, I applied a few coats of tung oil. In hindsight, maybe just doing a few coats of poly would work better (Pics 4-5). It looks great, but the poly would be cheaper, easier, and give a better clear-coat satin look. Pic 6 shows a not great up close photo. Above is a picture of the 8 x Oak Wine Barrel Staves I have. They have a ton of character and are so awesome and I was so stoked to make something with them. 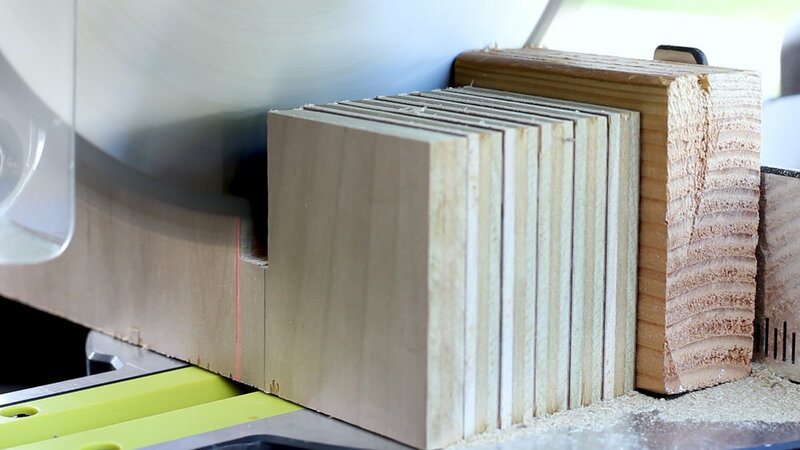 The thing to note is that, if possible, you should get staves that are of similar width and thickness to make the project easier. I had seen a cool / simple design for a barrel stool and I did some math in my head and figured out that I had enough material to make it (this was just based on a picture - no designs or measurements, so I just went with what I thought would work and made my stool the size that made sense with the material I had). So I made my cuts! Now it is Assembly Time! Note - I pre drilled all of my holes before screwing in screws to avoid the wood splitting. It's old - didn't want to risk it. I started by making my to legs pieces using one upper support and two legs for each piece. The last picture shows the final design. I took my four lower supports and assembled them. Two pieces were turned out, two were turned in - this was to make the bottom supports fit around the legs - see the next step for clarity. I then combined Assembly Steps 1 and 2 as such. You can see that the legs pieces were wedged in between the bottom supports with the wider part of the leg faces facing the inward facing staves. 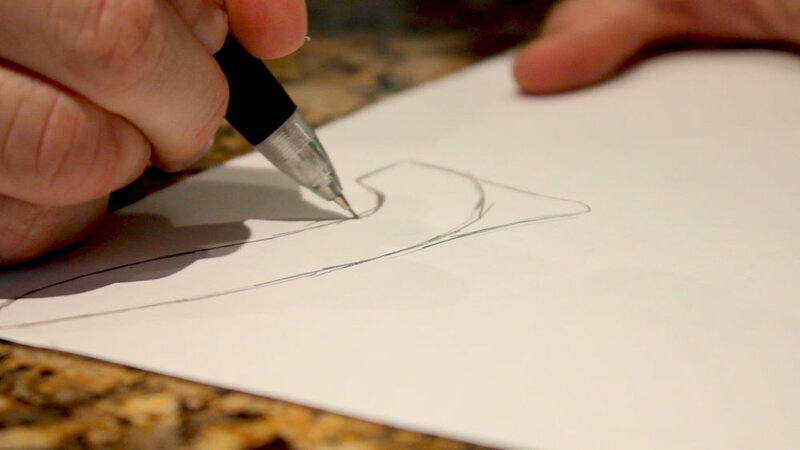 This is how the design comes together to be very strong and even. I attached my 7 x Seat Staves to the top of the legs using pre drilled holes and the asme wood screws. I made sure to square up one side so that I could just square up the other with a circular saw once it was all attached. The staves are not going to be the same sizes, so just run with it - it will be unique - just like you! As stated before, I then used my circular saw to square up the other size and lightly sanded down my edges with some 120 grit paper. At this point, the stool was done. There are a few things I could do to it additionally, such as put a sealant on it or really round over the edges. I might do that at some point, but for now, the stool looks great, is very sturdy, and I'm proud of my afternoon project! As always, thank you for reading! I would be so grateful if you could please subscribe to my Youtube Channel for future projects. I put out videos every few weeks. I'm slowly moving into doing finer woodworking / crafting. 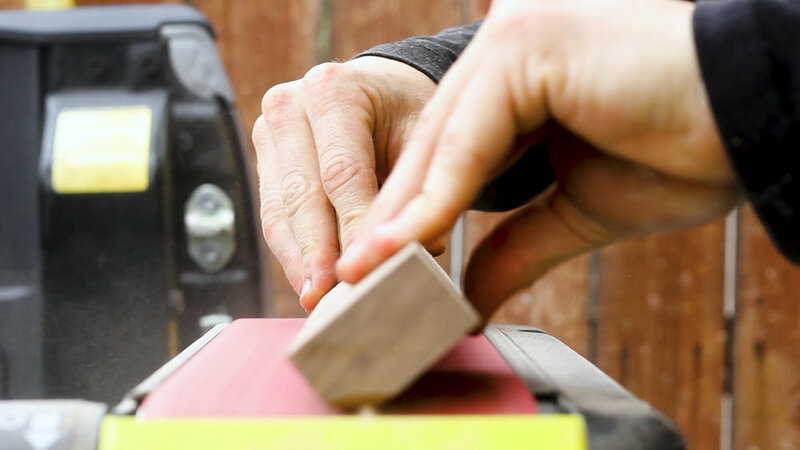 It means more precision, more attention to detail, and using tools I am still a beginner with. It means going slower in the process, but creating something I'm proud of. My mom wanted me to make her a few wine bottle / wine glass holders as future Christmas gifts. I saw it as a fun opportunity to work with lots of hardwood species! See the photo below for wood species! Use any material you want. I wanted variety, and I knew what tools I had on hang, so I went with five different species for my build. I had Ipe and Walnut scraps, and I purchased Maple, Mahogany, and Poplar. 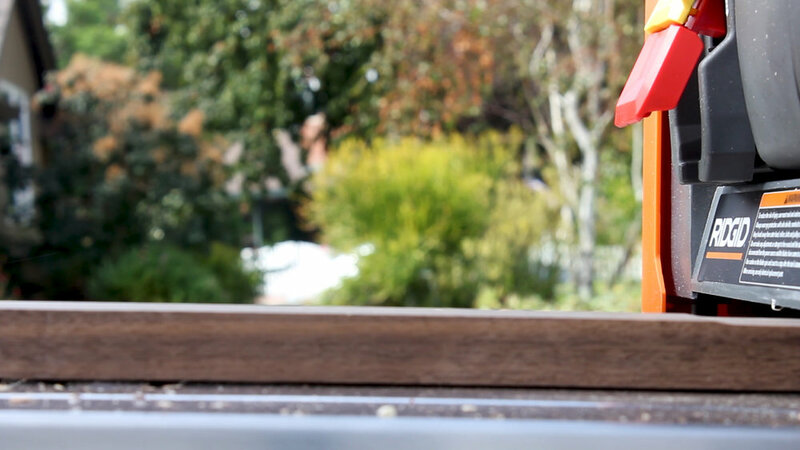 All wood is about 4/4 stock in thickness and 2 feet in length. I didn't have a huge amount of methodology to how I ripped my strips, other than that no piece would be wider than 2" and no thinner than 1/4", and I would try to mix up the variety as much as possible. 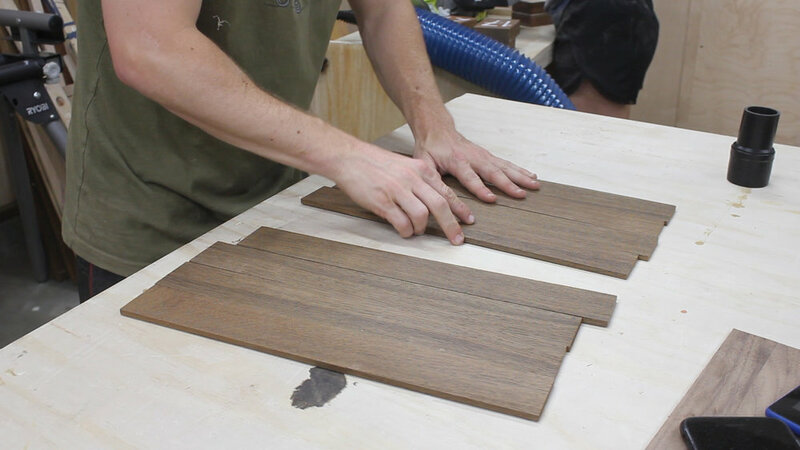 Once you have all your strips cut and the surfaces are clean for gluing (should be fine coming off the table saw), mix them up how you want to and get ready for the glue up. Nothing special here. I applied enough glue to spread out and cover all of my surfaces. Keep it flat as you clamp up, and let it dry overnight. I used an old card to spread my glue, and I do my glue ups on top of a flat piece of plywood covered in masking tape to avoid any sticking. 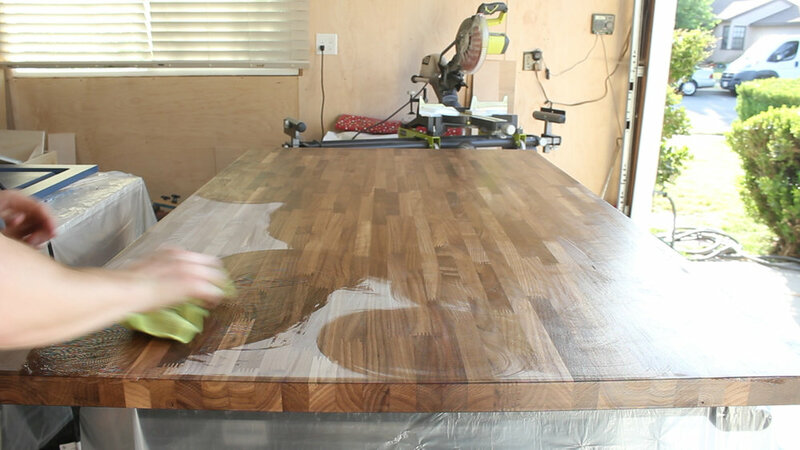 After your glue up dries, you can run it through the planer a few times to clean up all of your surfaces. I tried to keep the final thickness at least 1/2", but that will be based on your starting material size. Next, I cleaned up one edge of the large blank and I ripped my blank into four pieces, all 4.5" wide. I marked out a center hole and two holes on each end that would accept a wine bottle and wine glasses, respectively. The center of the two outside holes were 1.25" in from the outsides, and I used a 7/8" forstner bit to drill those holes. 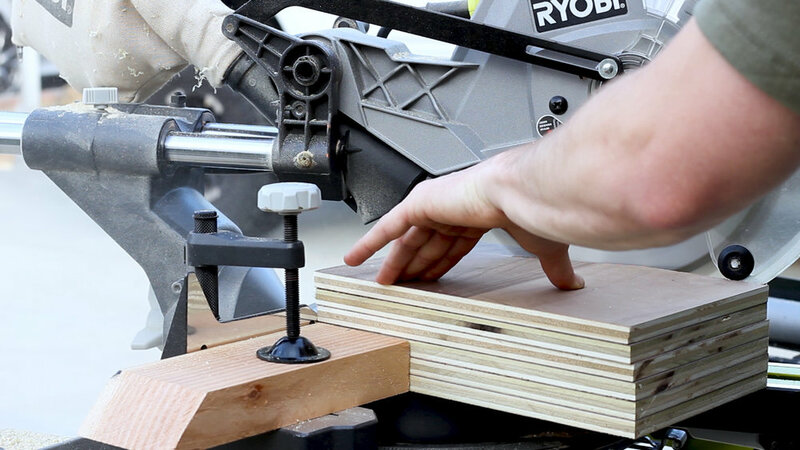 Make sure you secure your piece firmly to your surface with a clamp. I then drilled the center hole with a 1.125" forstner bit. 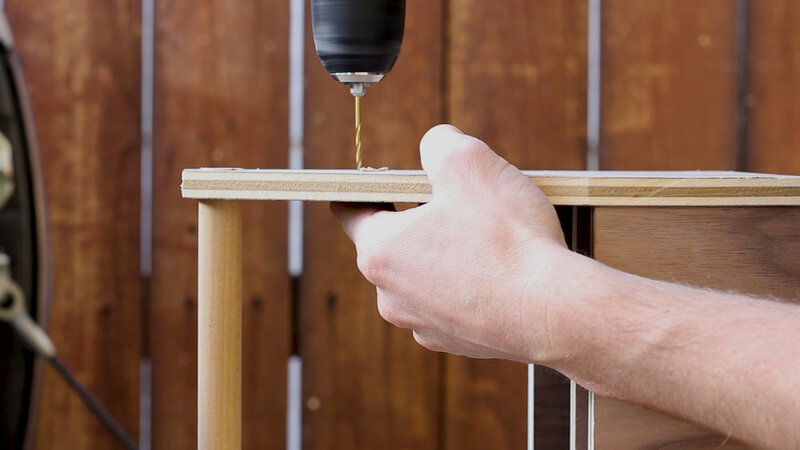 Once all of my holes were drilled, I use my miter saw to make two cuts, creating alternating grooves to the two wine glass holes. Pretty straight forward, just make sure you're piece is secured and you take the cuts slow. You can see in the last picture how those grooves come together. 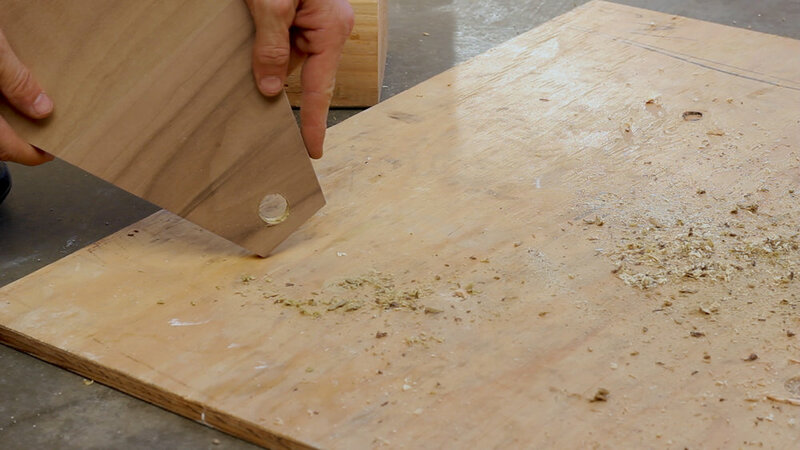 NOTE - If you plan to route your edges, make sure that you cut these slits wide enough so that your router bit and bearing can travel through it cleanly. You can make these any shape you want. Pic 1 shows me using some scrap edge banding and tape to create a smooth line to cut later. Pic 2 shows me using a circle to create rounded edges. I then roughed everything out on my super awful band saw that I need to replace (Pic 3). I then switched to my stationary belt sander in Pics 4-6 and smoothed over all of the edges, corners, and surfaces using 80 grit on the sanding disc and 120 grit on the belt. I also used new discs and belts for this - something I learned makes the world of a difference for just a few bucks! I used a 1/4" round over bit and my palm router (Pic 1) to break all of the edges. Pic 2 shows all the edges routed and the two shapes I created from my blanks in the previous step. I then did some final belt sanding of the rounded edges (Pic 3) and some wet and dry hand sanding (Pic 4) to finish these guys off. I cleaned my surfaces with mineral spirits and then applied thick coats of mineral oil to all the surfaces to finish them off and bring out all of the colors. They looked beautiful! 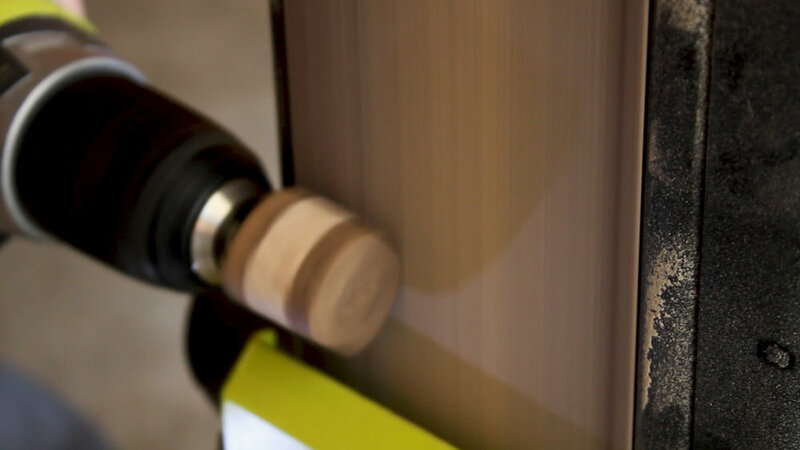 Pic 1 shows the final wine bottle / wine glass holder (or at least one version), and Pic 2 shows how it functions! Perfect for any date night or table / kitchen counter! This project is pure experimentation - I wasn't sure how it'd come out. Spoiler - it was a decent success. It was my second concrete project ever, and it was a step forward in advancing my maker skill set. I guess you could chalk it up to wanting to try mixing resources with the fact that I already had most of the materials on hand. I made many passes through my planer with the log in one position (I'd say 25-30) in Pic 1 to get to a nice clean flat surface in Pic 2. 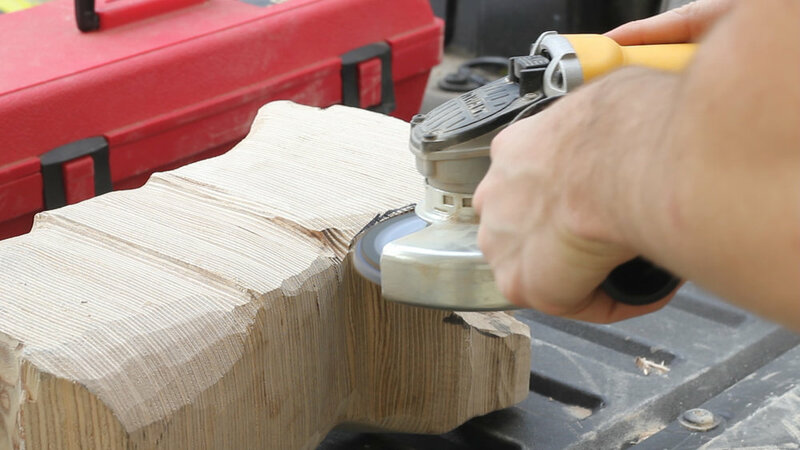 Then, I could flip the log over and over again, making incremental passes (Pic 3) until I was happy with the thickness of the piece, which was roughly half an inch. I wanted both sides to be very clean so I could later pick which side I liked best to be featured. Then I squared up both sides carefully (Pic 4) on the miter saw and was left with a perfect small live edge slab. Once you build your mold, take paste wax (any brand) and spread it around all of the corners of your mold (Pics 1). 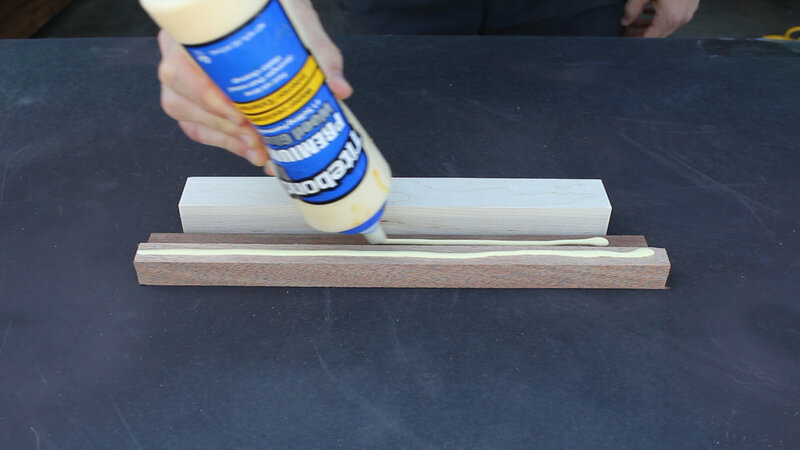 Then, using a caulk gun, spread black silicone sealant around all of the edges and corners of your mold (Pic 2). Using a simple cake fondant tool (Pic 3 - link to this product in Step 2), you can run the small circular end over all of your edges leaving you with really nice, rounded edges (Pic 4). Once the sealant cures after about 30 min, you can go back and peal off all of the excess that it created (Pic 5). 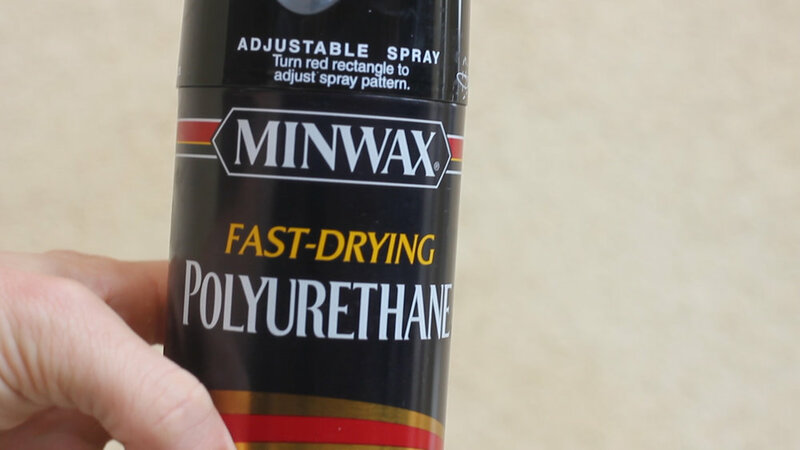 You are able to do this very easily due to the paste wax you spread out earlier. Once you've pulled off all the excess, go back with mineral spirits (I had a small amount in a water bottle - Pic 6) and wipe off all excess paste and clean up the mold. Off camera, I also covered the TOP of my slab in painters tape. That way, the concrete couldn't get on the mold incase some got underneath (Pic 3). I also gathered all my materials to cash. I mixed Quikrete 500, water, and stirred up the mix in an hold laundry detergent container (Pics 4-5) and then poured in my mold (Pic 6). 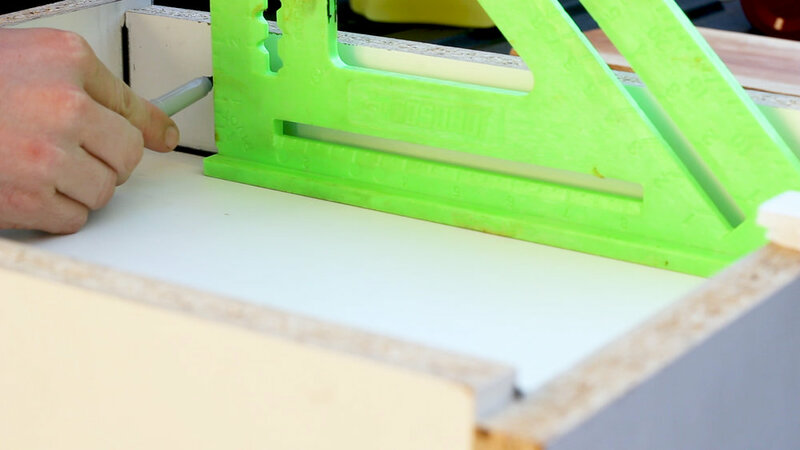 OPTIONAL Tape down your slab to the bottom of the mold using double sided tape. 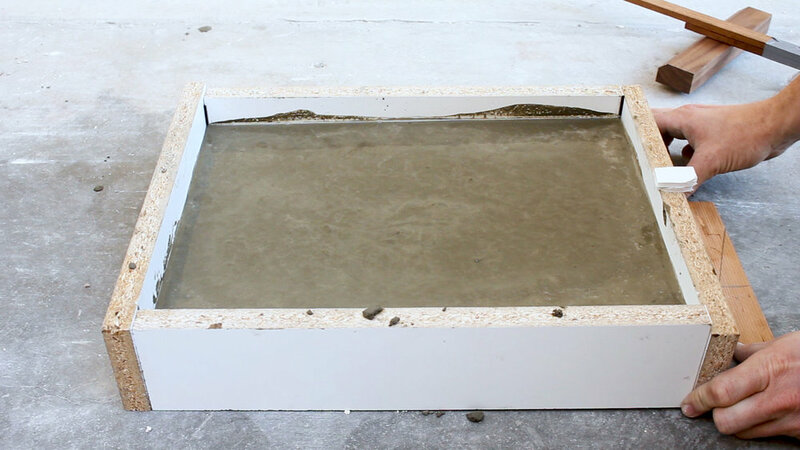 TIP 1 Use a large bucket to mix concrete all at once - I had to do this 4 times to fill my mold entirely - and I know for a fact that each pour had different consistencies in the concrete. 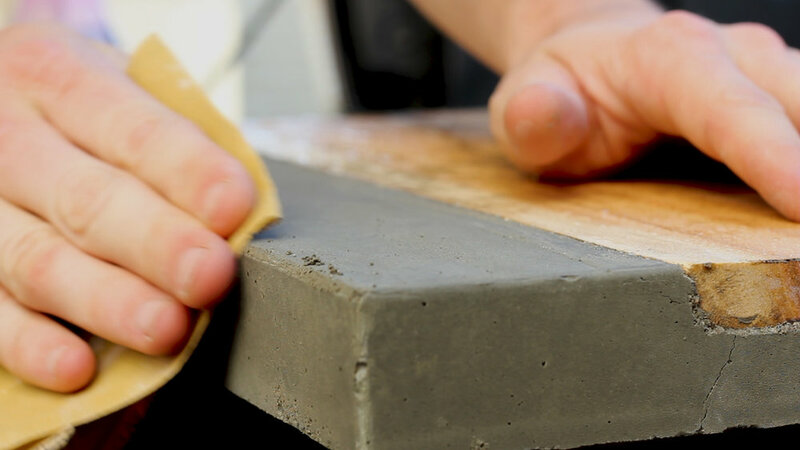 TIP 2 If you're looking for a very fine concrete, you should look to get Quikrete Countertop mix or use a sifter to filter out the larger rocks of the mix. I wish I had done this, but it was a learning experience nonetheless. Once I poured my mold, I shook the mold back and forth quickly to spread things out and used a tool to vibrate the bubbles (Pic 1) - you can use anything you have for this - a sander, a multi tool, etc. Having checked before that the ground was not level, I knew to shim up my mold 1/8" on one side to keep it level (Pic 2). 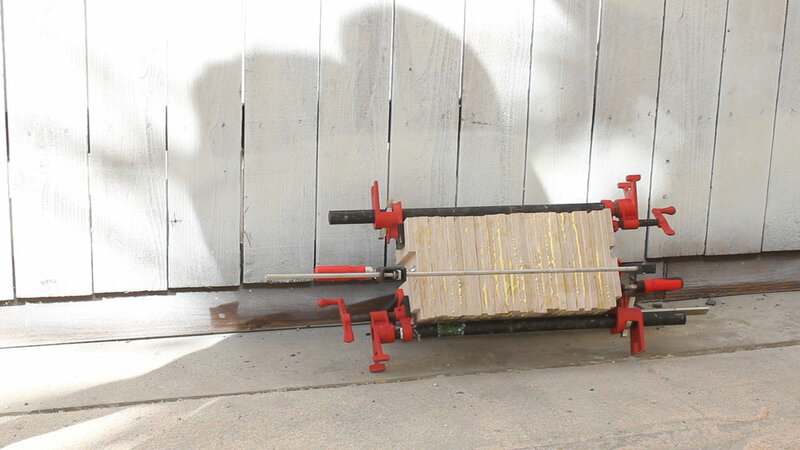 I worked up a little contraption in Pic 3 that allowed me to suspend my two legs into the concrete while it cured. Just scrap wood and hot glue - and I was very careful to check that everything was even and square. I had put in a lot of work at this point - no need to mess up now! I checked for evenness in Pic 4. PRO TIP Your molding tops might not be level - MINE WERE NOT. You can see in Pic 4 how the right side has two pieces of foam to prop up the contraption. 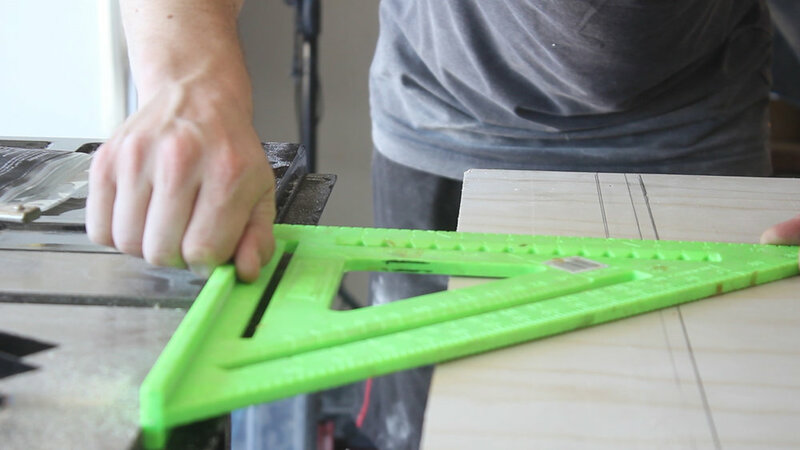 If your molding is not even like mine, your legs will not sit level in the mold and will cure at a slope, So check for this levelness ahead of time. Here are various photos of the final product - both overall and in detail. Many ways to improve, and I intend to do so soon! I have a gooseneck tea kettle we use for making coffee-pour overs. It works great, but it is very basic. I felt like making it a little bit better (12% to be exact). Hope you enjoy this little fun project. I obviously made mine a bit more complicated by using multiple woods, etc, but you can do it quite easily with just a single piece. I went all out on this one, using pretty much everything I had in my arsenal to make something so simple. I'm sure there are easier ways to do it (no planer, no band saw, no router), but I did it this way. I leave it to you to figure out the best method to up-cycle your equipment! I removed the two components I'd be replacing using just a screwdriver (Picture 1). I then traced (Picture 2) both components and took super detailed measurements just to have on hand (Picture 3) using various measuring tools (digital caliper, tape measure, etc.). These measurements were helpful in planning my scrap material search. I had walnut and maple laying around (Picture 1). My maple was not wide enough to match my walnut, so I glued up / laminated (Picture 2) and clamped up (Picture 3) to pieces to let dry overnight. 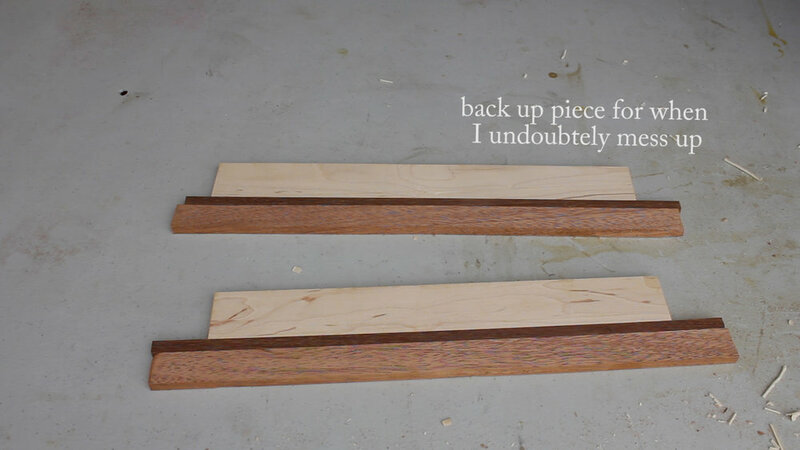 The next day, I planed down the walnut strip to about .25" (Pictures 4 - 5) and the maple strip to about .50" (Picture 6). This was all based on a design I had in mind. If you're not gluing up anything, etc. and it is just a solid piece, you'l want to have clean scraps that will fit the size of whatever you're replacing. Also, note the snipe in Pic 6 - still working out the kinks on my new planer. I cut my walnut piece in half (Picture 1), as well as trimmed off the ends that had imperfections (Picture 2). Note - I kept these scraps as I figured I'd use them to help replace the lid top. More on that later. Next, I laid out my final design - you can see how the maple strip was planed to be thicker than the two walnut strips to help make this pattern (Picture 3).I then glued up and clamped up (Pictures 4 - 5) to let my pieces dry overnight. 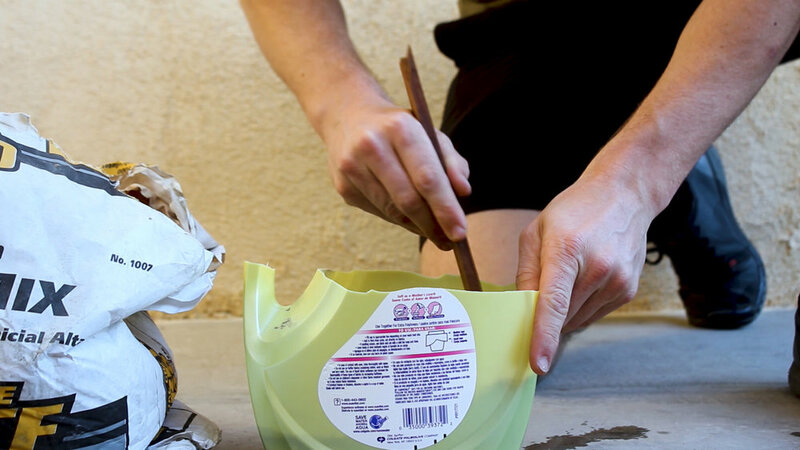 Make sure you spread your glue evenly so everything is covered. I took my drawings from earlier and revised them to a shape I thought was cool (Picture 1), and then cut them out (Picture 2). I transferred the design to my blank (Picture 3), and then cut out the blank using my band saw (Picture 4). Picture 5 shows the first pass at roughing it out. I cleaned up as many surfaces as I could using my stationary belt sander (Picture 1). There were quite a few areas I couldn't get into at this point. This was just to smooth out as many rough surfaces from the band saw blade as I could. 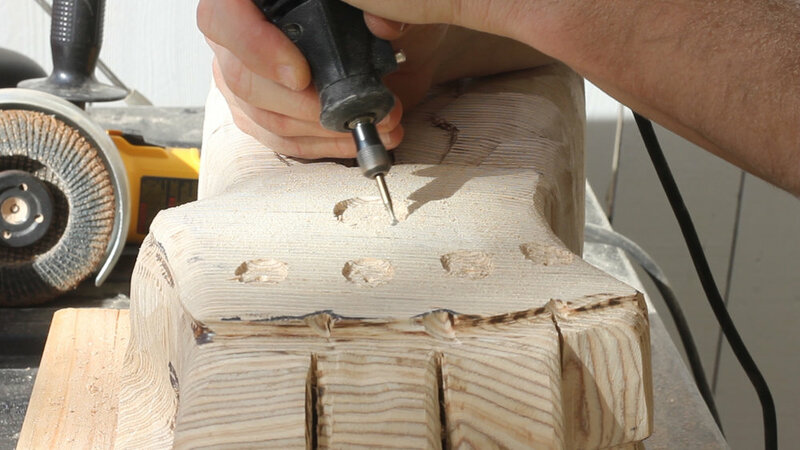 I then used my palm router and a vice clamp to route out a profile on the underside of the handle (Picture 2). 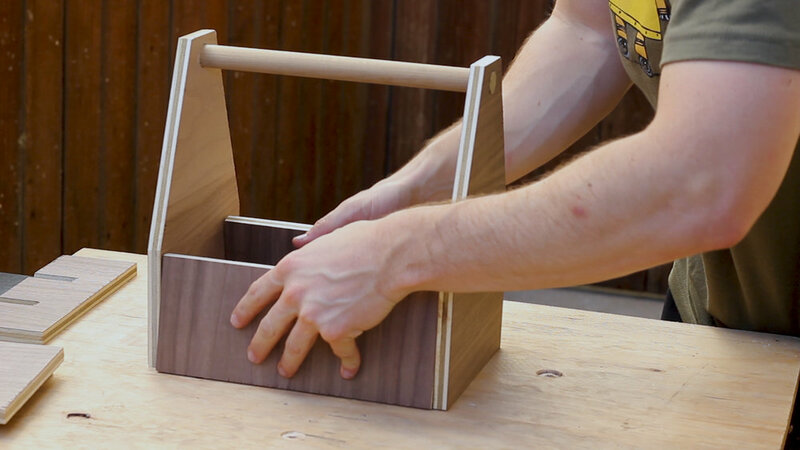 I didn't know exactly how this would come out, but the goal was to make it more ergonomic to hold as well as help better highlight the different wood species. I cleaned up the rest of the piece, including the curves, any burn marks, and overall just rounded and smoothed over the piece (Picture 3) using some fine grit sand paper (I did this both as a wet and dry sanding to raise the grain and eliminate that issue down the road when the tea kettle got wet). Picture 4 shows the final piece - you can see how everything was smoothed over (as best I could) and routed to make it easier to hold. Not bad right? Again - I had no idea what this should look like, so I just experimented until I was happy. Pictures 1, 2, 3, and 4 show a sequence of me cutting out another small blank from left over glued up wood, drilling a pilot hole, inserting a screw, and putting that screw into my drill. My goal was to create a sanding lathe type thing using a drill and my stationary bench sander as I don't have a lathe to turn. Pictures 5 show me spinning the drill at high speed against the moving belt sander, resulting in a (mostly) round top. I thought it was a bit clunky though (Picture 6). In Pictures 7 - 8, I took the top back to the bench sander and just smoothed out what I felt was a cool geometric shape. No real design in mind, just flattened in a pyramid shape until I thought it looked cool! I then took the original lid piece and screwed it to one of the scrap pieces of walnut (Picture 1) that I had from earlier (remember I said to save those just incase!). 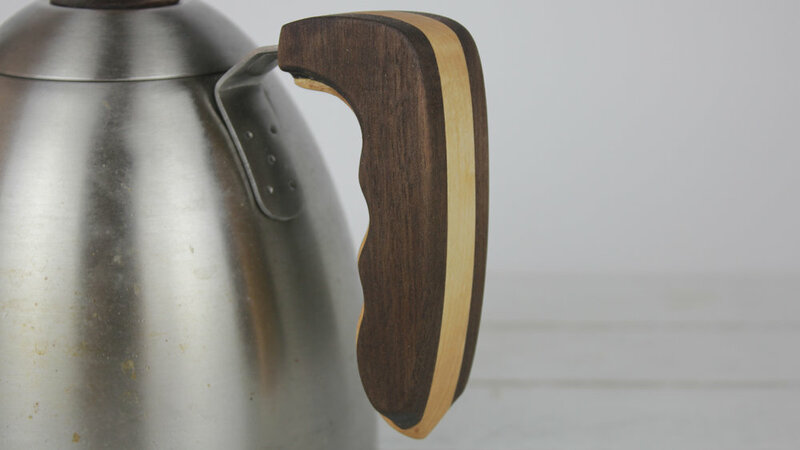 I then crept up on the circular shape of that same top using the disc sander (Picture 2), and then flattened it out and gave it a bit of a taper (Picture 3) so that it would be flat, very low profile, and fit within the lid top of my tea kettle. Picture 4 shows the final two pieces. I then glued these pieces together and let them sit overnight. Using my vice again and a small drill bit, I drilled a bunch of holes (Picture 1) to create the larger hole that the tea kettle would slip into (Picture 2). 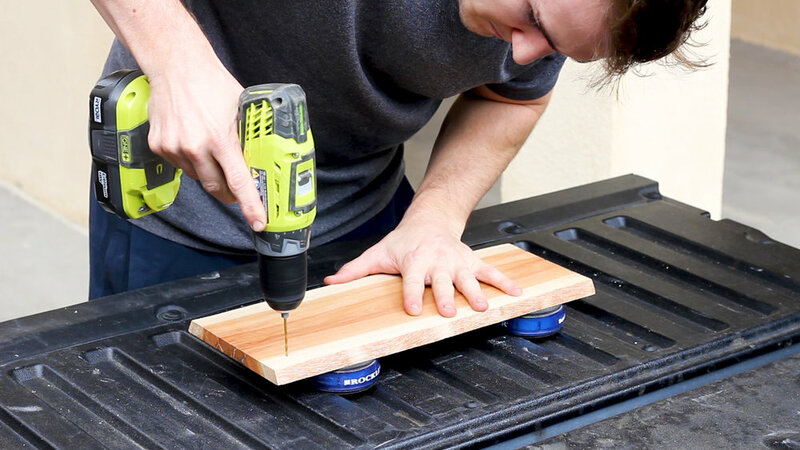 To make this easier, I'd drill small holes, then slowly increase the drill bit size so that they'd all slowly come together to form one large hole, testing the fit in the process. The goal was to make it fit, but make it very snug. After all was finished, I used some food safe mineral oil to finish the wood, protect is slightly, and bring out the grain. It looked great! Then, using the hardware from the lid, I installed the new top (Picture 1) - it looks..."okay". Then, using just pressure and friction, I forced / hammered on the new handle (Picture 2 and 3). It fits very well and doesn't require any hardware. If, for whatever reason, I eventually need to secure it more, I think I'll just use some 5 minute epoxy. The above gif shows the transition. 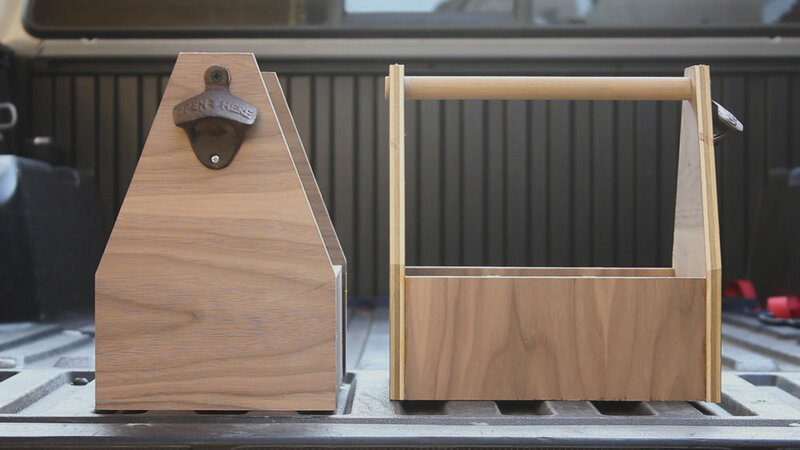 Obviously this is a small and subtle overall change, but as a woodworker / maker with a desire to do a bit more "fine" woodworking, I thought that this would be a fun project to tackle in my free time, film in a macro sort of way, as well as share with the maker community for inspiration. I always have messy hair. So in this episode, I used some scrap pieces of wood I had to make a comb - it was a fun two day simple project and the result was pretty amazing. Step one was to take my scraps and cut them to length - I cut them all about 12-15 inches depending on the available materials. I then cleaned up everything on my stationary belt sander which had a 120 grit belt on it - this would make gluing up much easier and cleaner. Once I had my strips, I could glue them up and let them cure overnight. And incase I botched the project the next day, I made a back up blank as well. The next day, I could plane it down to my desired thickness. I eye-balled this, but it was maybe 3/8" thick. You can see the two final blanks in the second photo. I then cut out and glue on the template to my blank using spray adhesive. I then modified it so my comb would have a handle. I then went to cut out my shape. I was super ambitious and thought a coping saw in a vice would be the best route, but I gave up after about 9 seconds of sawing and getting no where and went with my newly purchases (used) bandsaw. It worked great - just take your time with it! 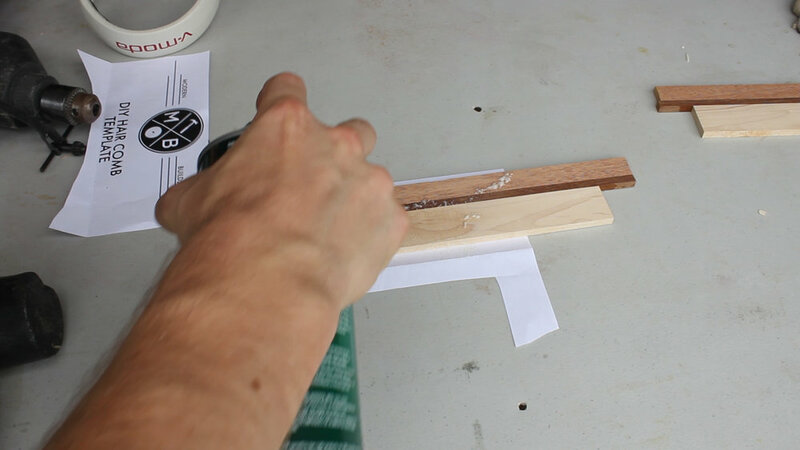 I then went back to my stationary belt sander to round over all of the edges and tape the bristles. Take this slow but also be forceful at the same time. 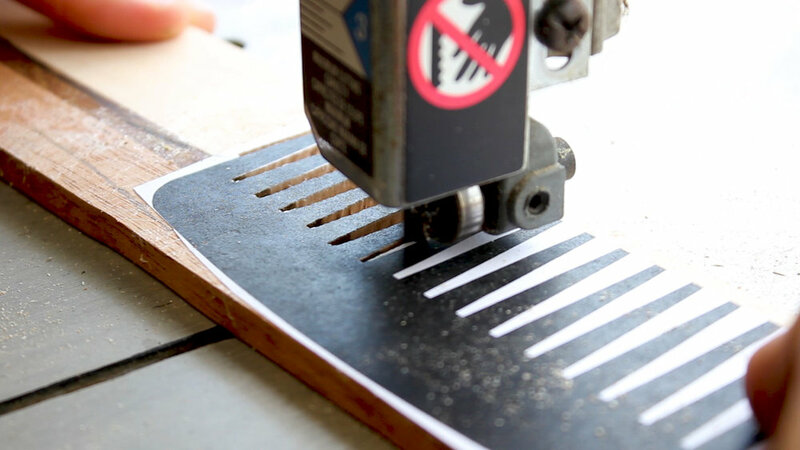 Using a rafter square to press all the bristles down at the same time makes it super easy to give you a nice taper using 120 grit paper. 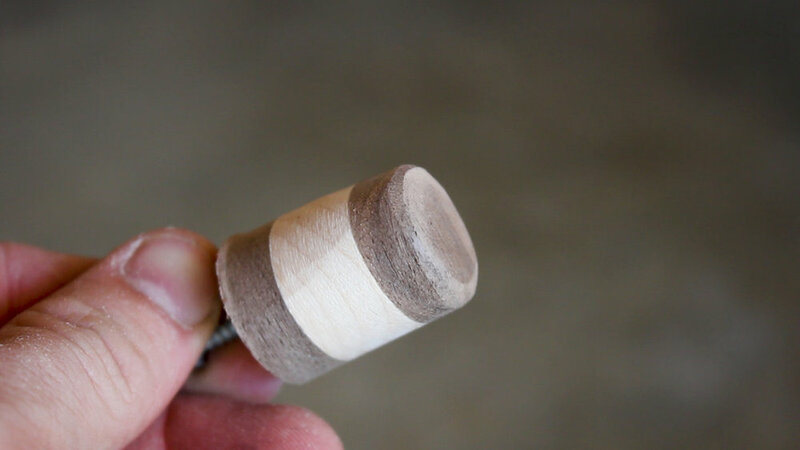 I then used a strip of 120 and 220 grit to individually round over all of my bristles on each side and then fine tune all of the outside curves. Was looking good! Last up, I applied mineral oil to finish the project and bring out the grain and color. I'm sure there are other finishes, but this worked great for my case. Then I was done! I tested it out and it worked great and I'm super happy with the result! Full video of this amazingly fun and versatile project is below which can be found on my Youtube Channel. The initial steps for this project can be done based on your access to tools. 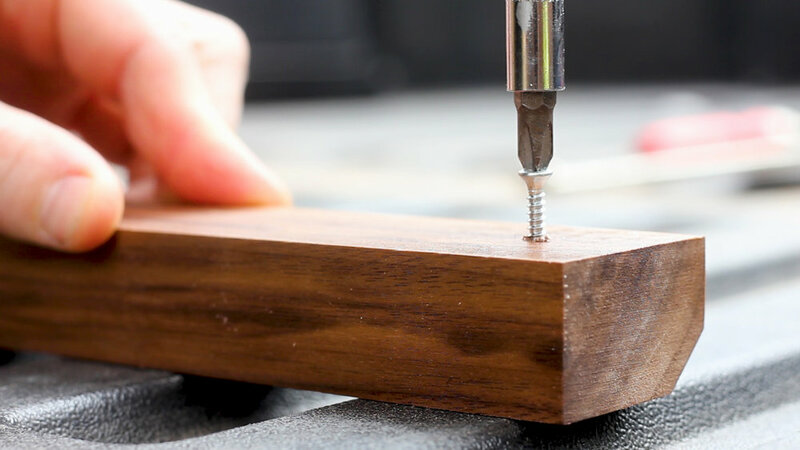 Incase you've never drawn a hex nut, the above gif will show you how to make your own using only a compass and straight edge. A fun trick to know!